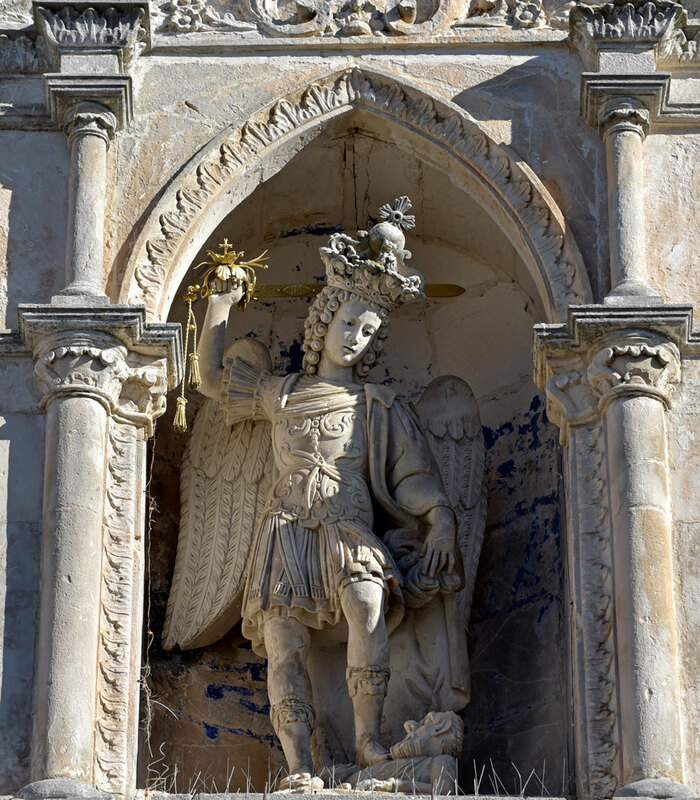 The Feast of St. Michael for images! 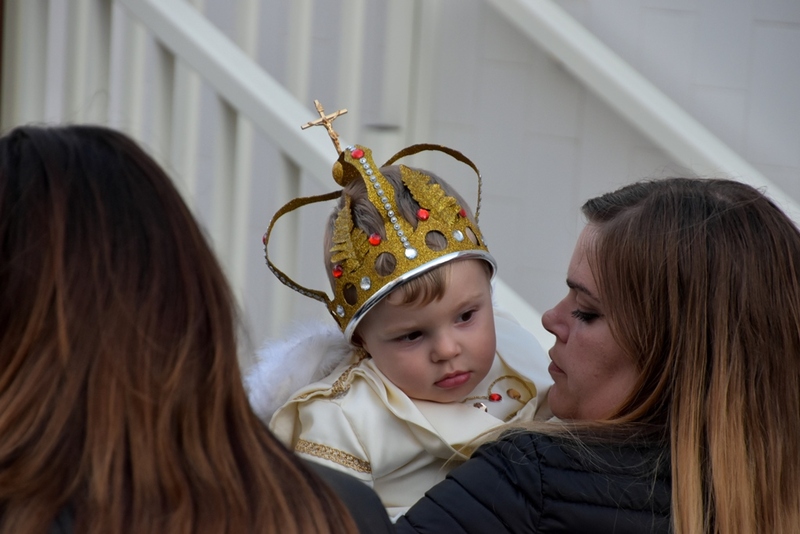 Joy, prayer, participation, sonship, devotion, gratitude, faith: some of the numerous nouns that can define the Feast of the Archangel Michael and that, in the contents, can represent its legacy. 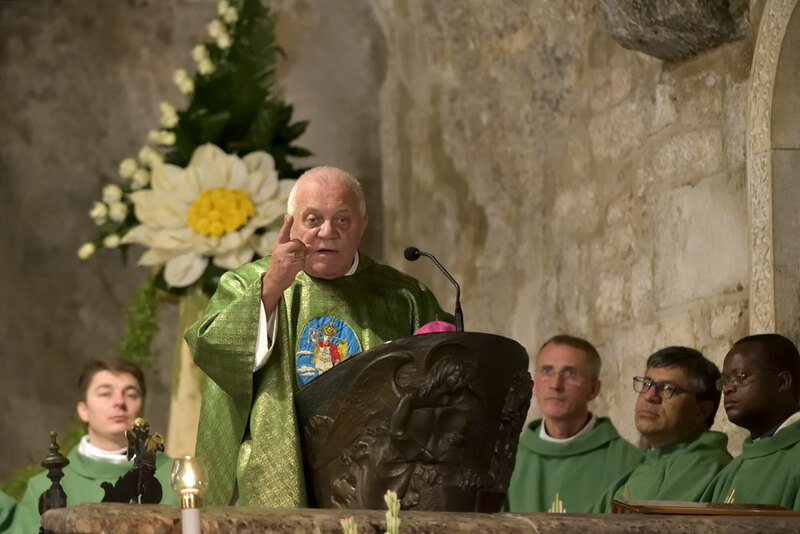 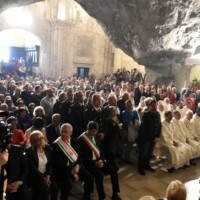 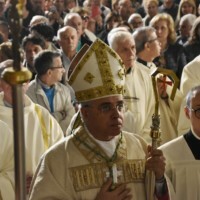 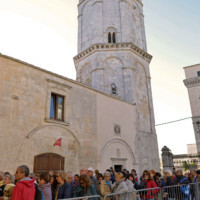 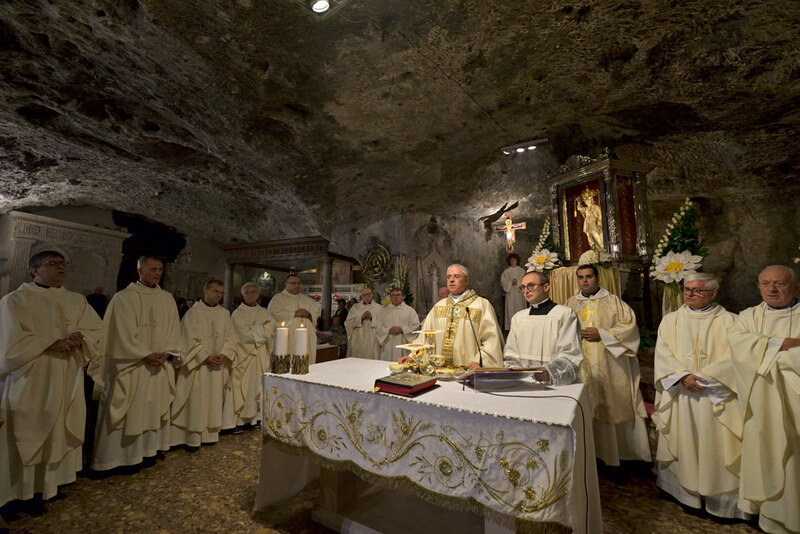 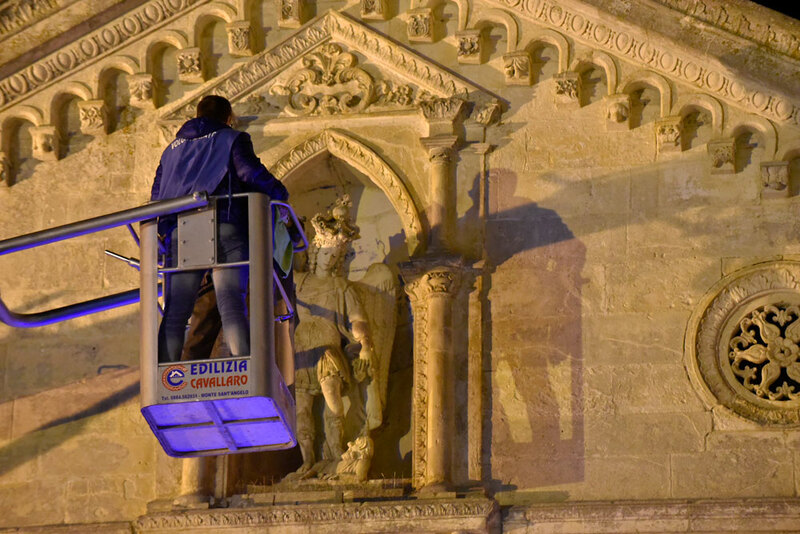 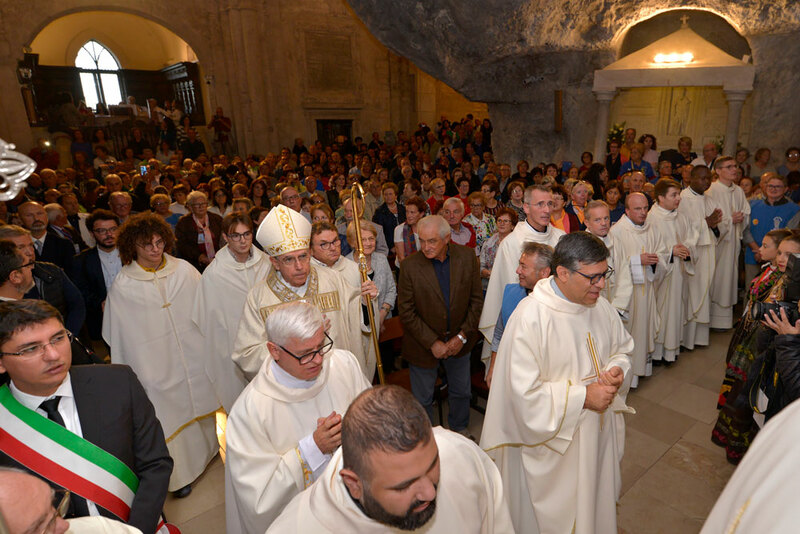 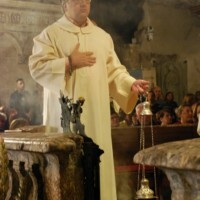 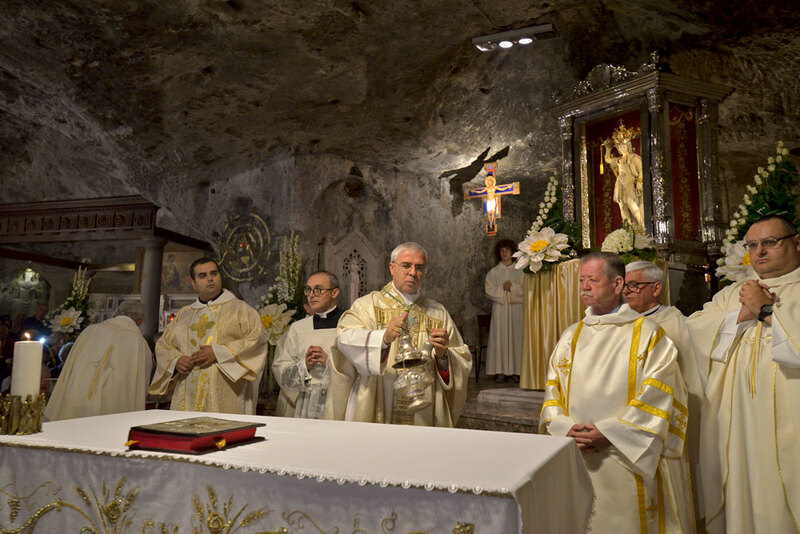 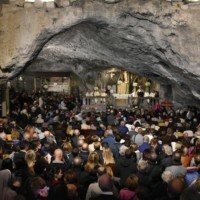 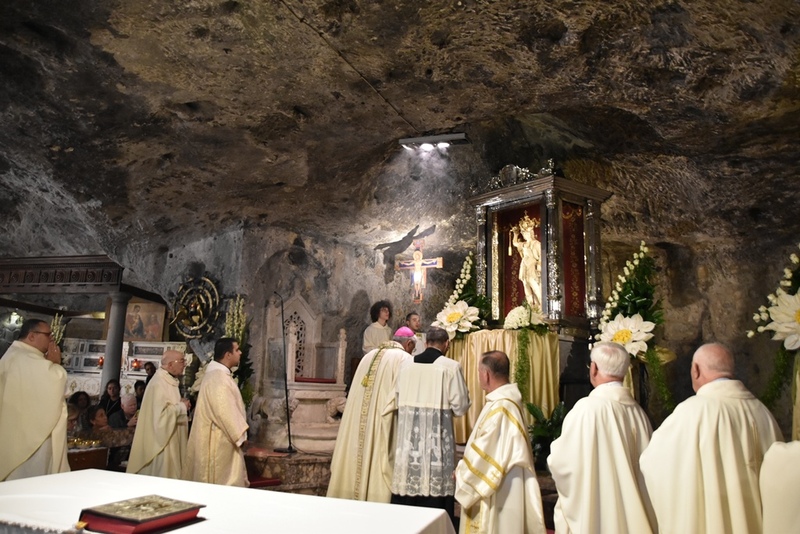 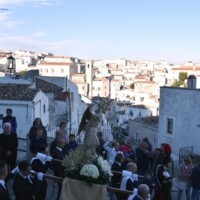 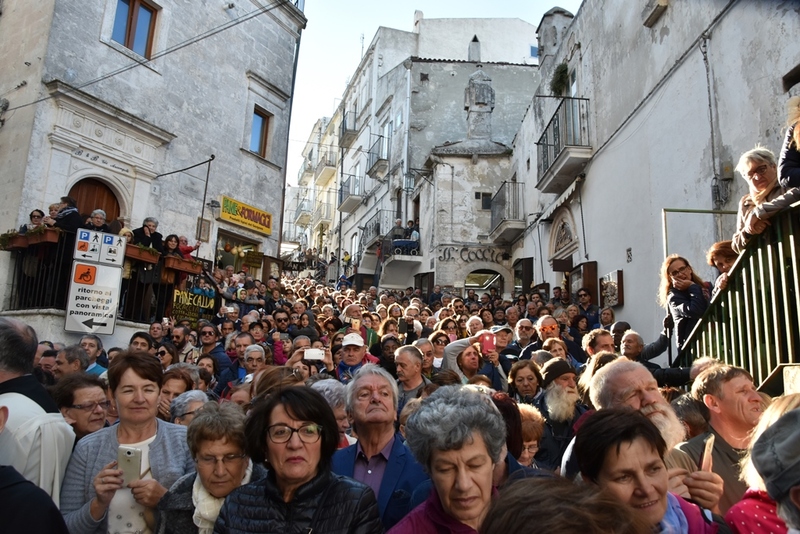 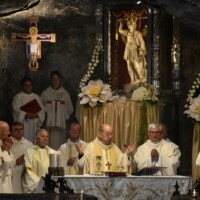 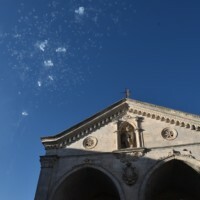 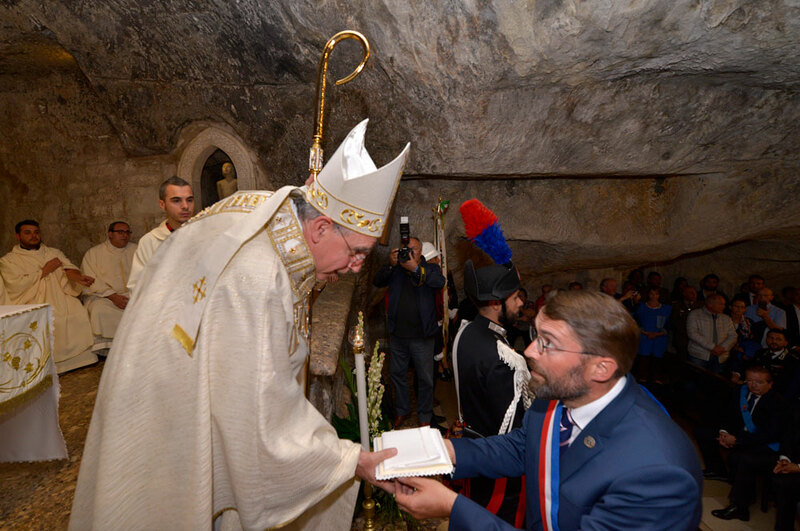 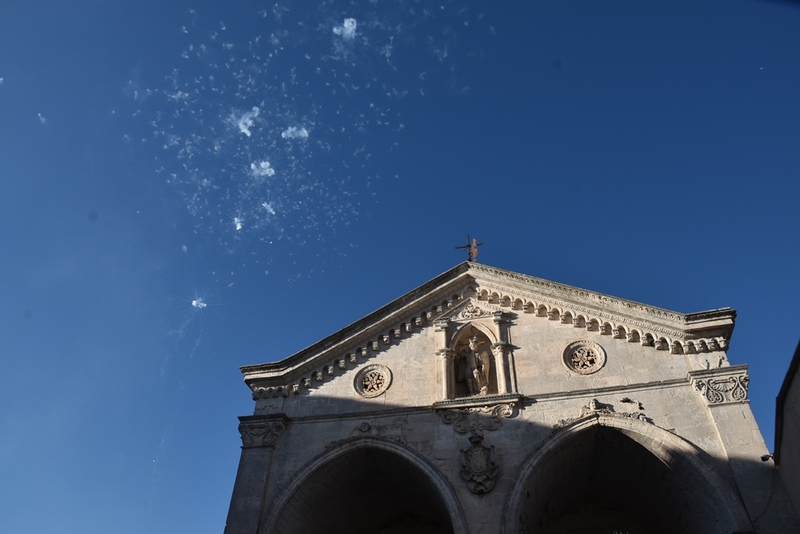 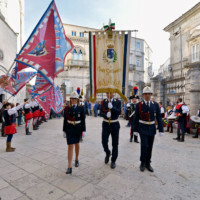 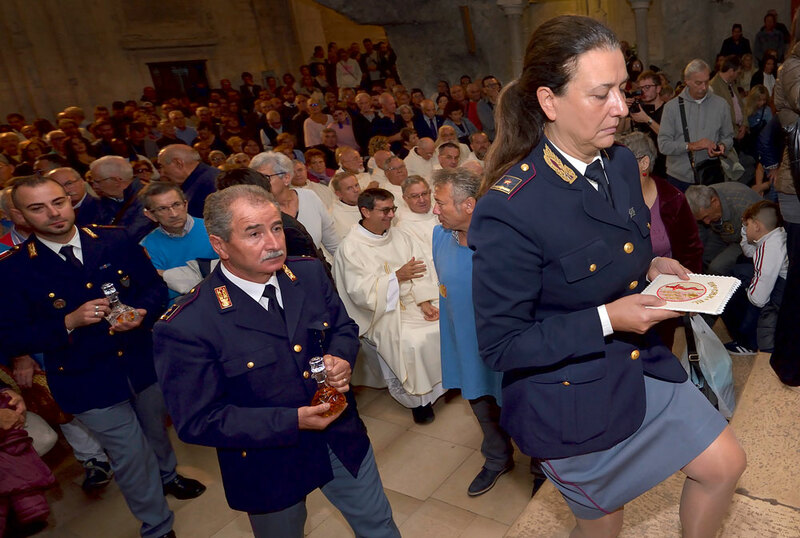 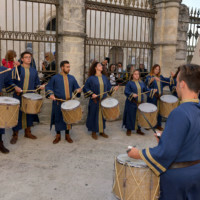 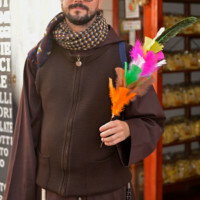 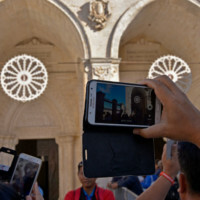 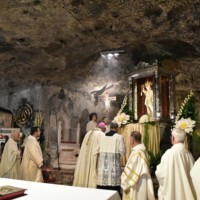 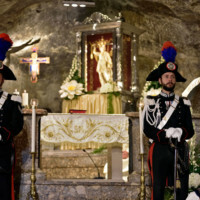 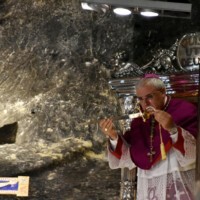 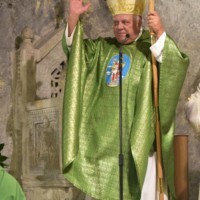 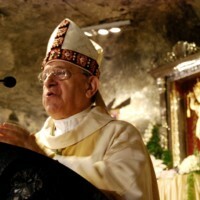 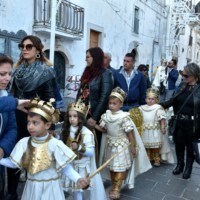 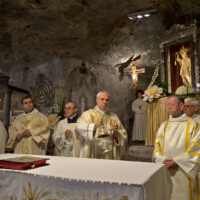 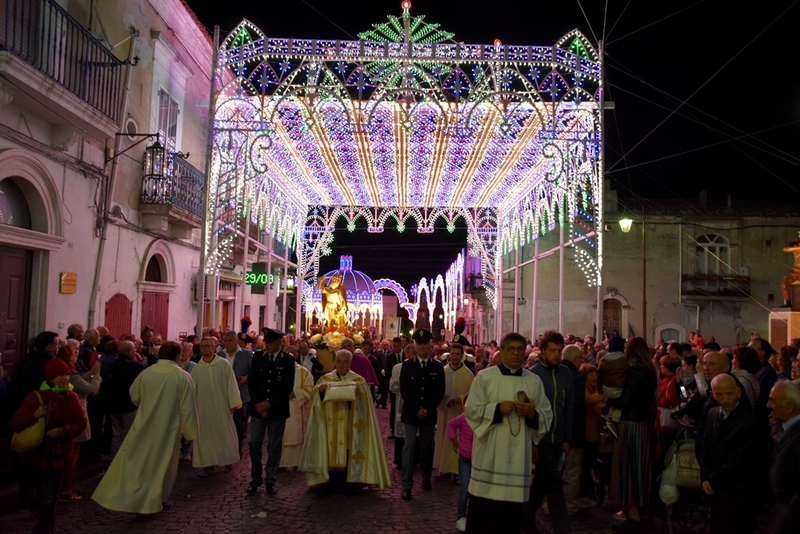 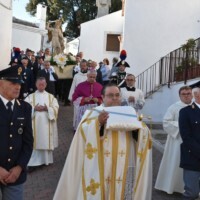 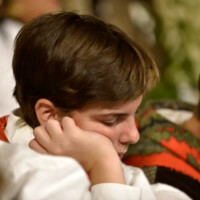 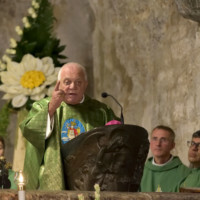 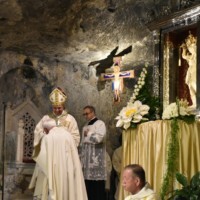 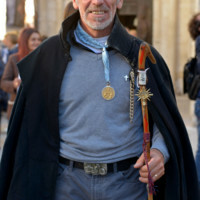 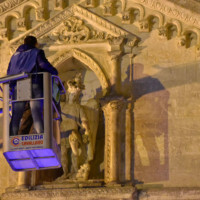 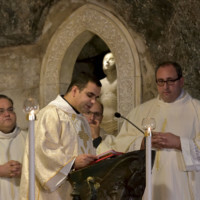 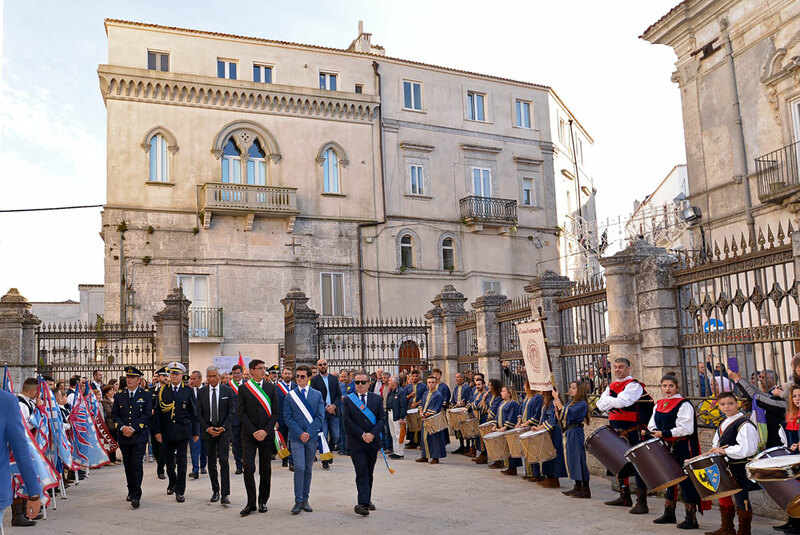 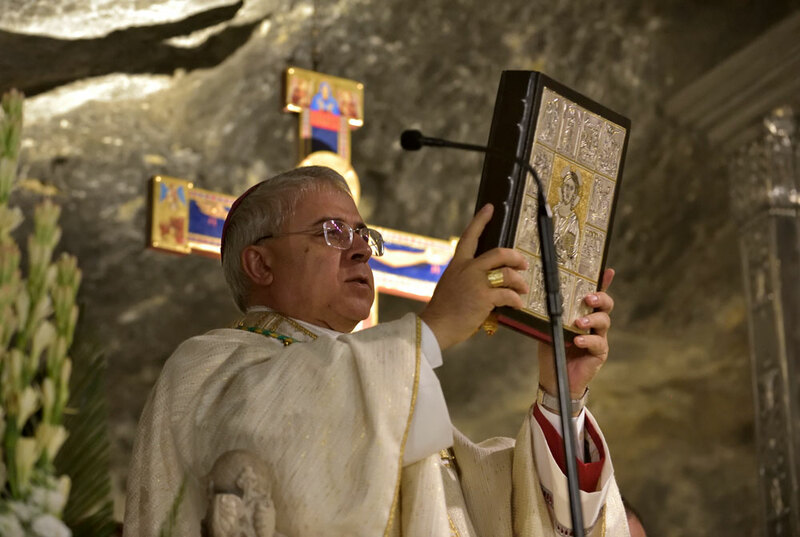 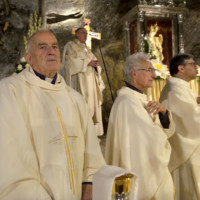 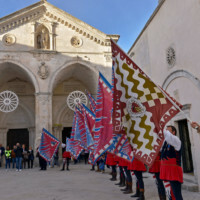 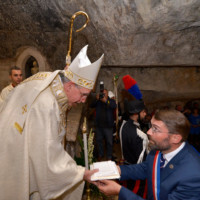 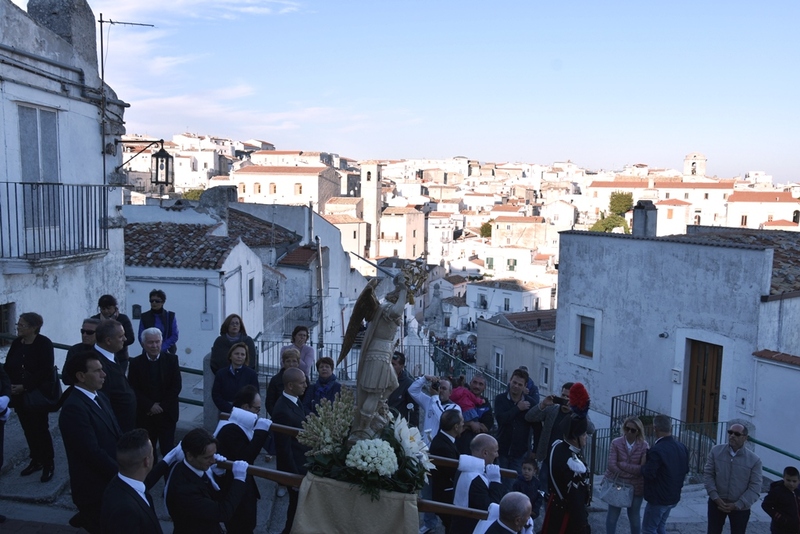 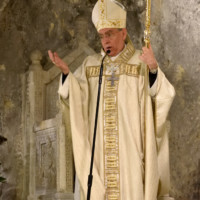 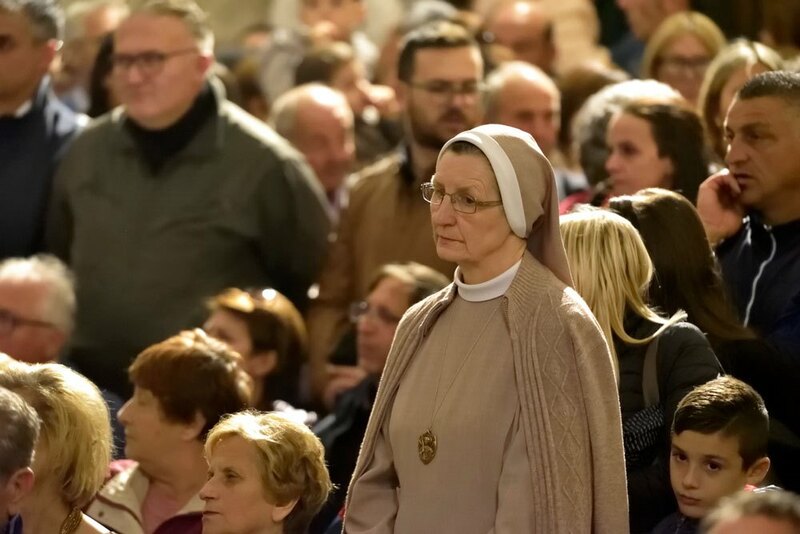 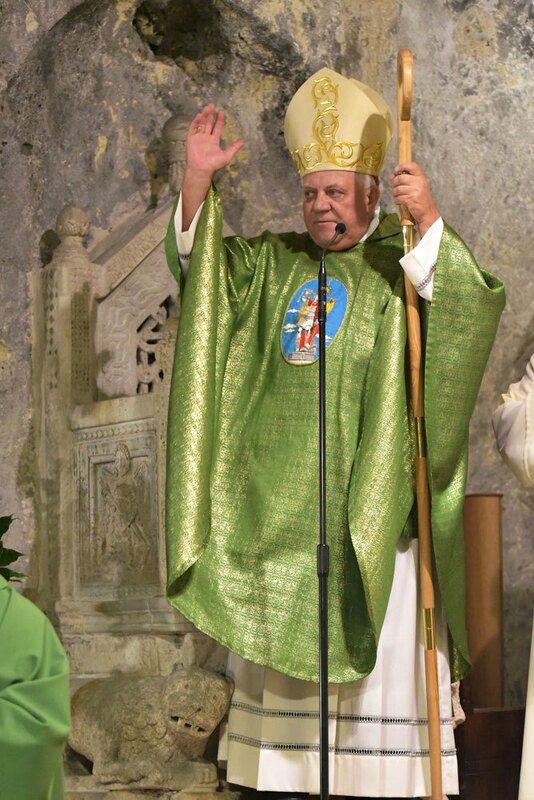 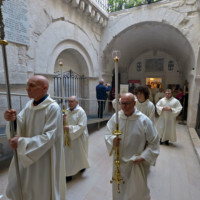 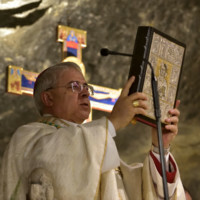 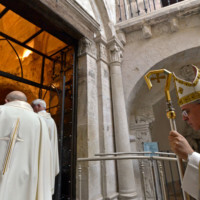 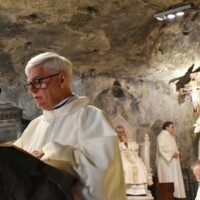 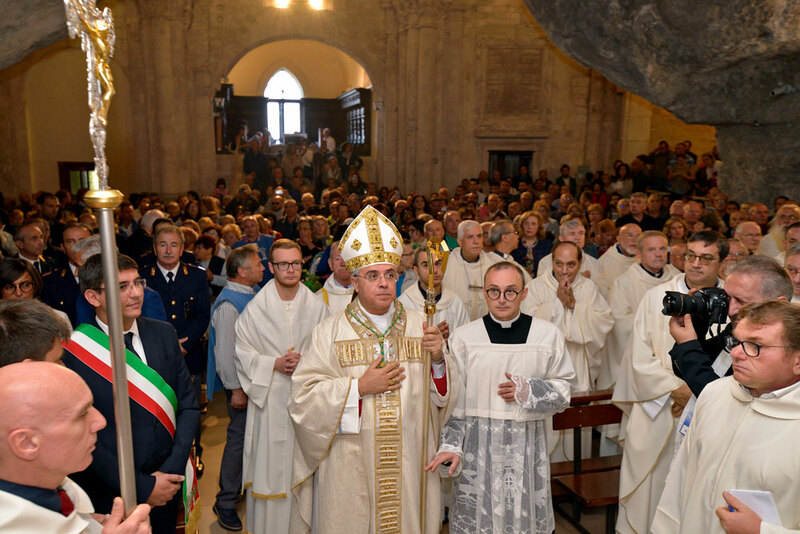 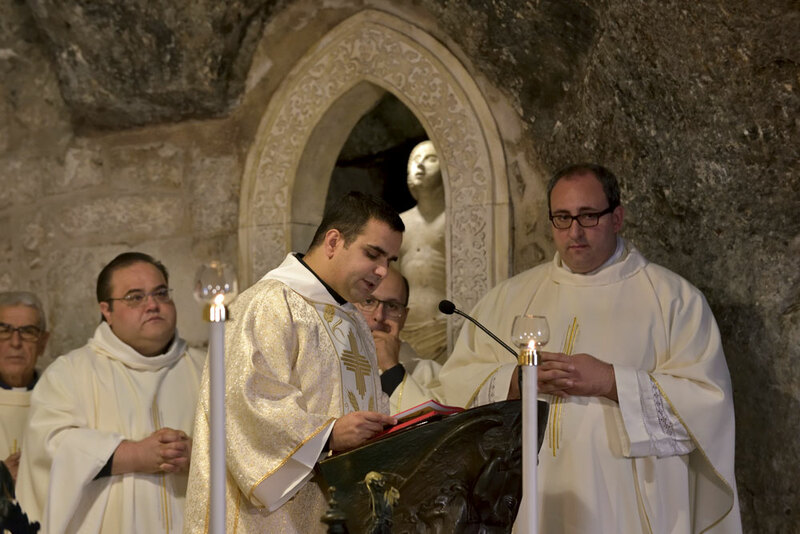 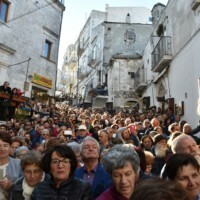 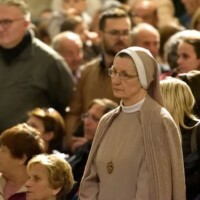 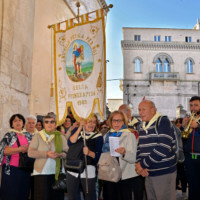 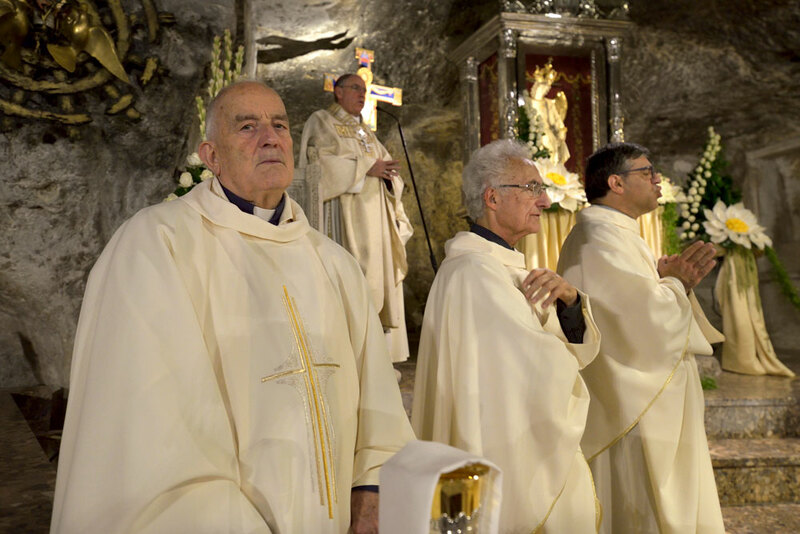 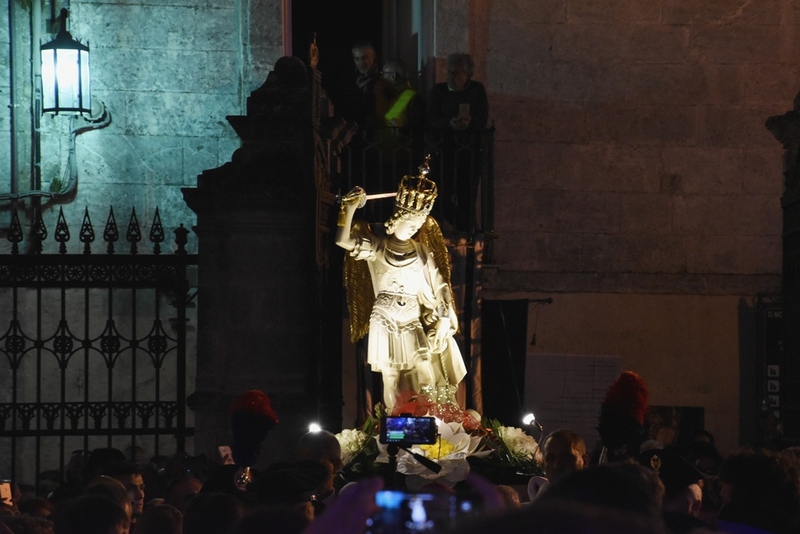 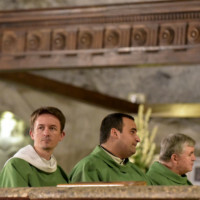 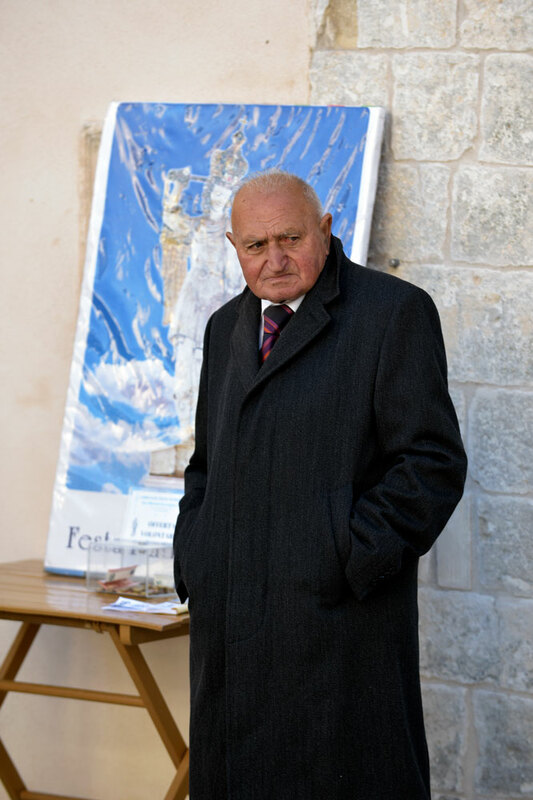 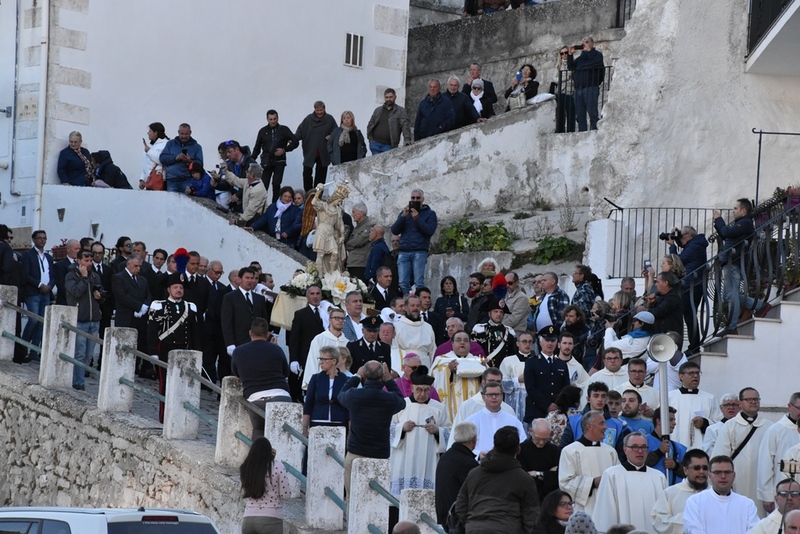 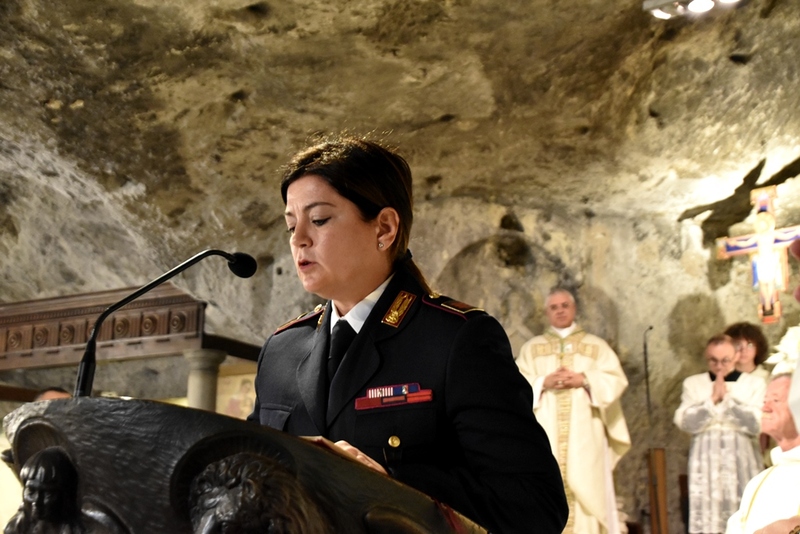 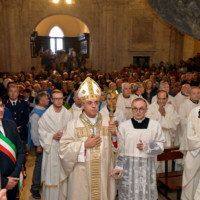 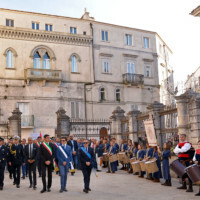 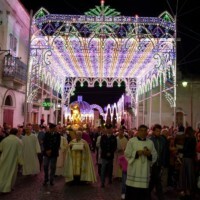 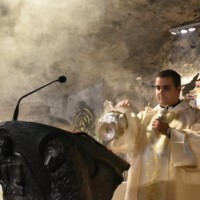 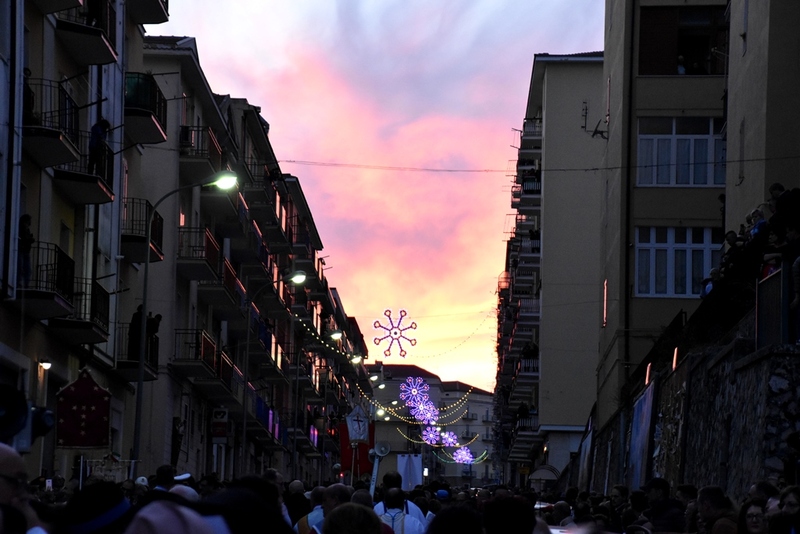 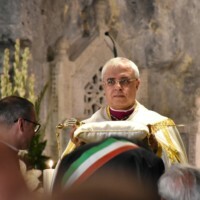 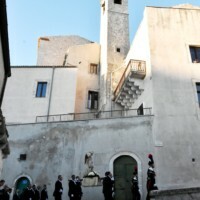 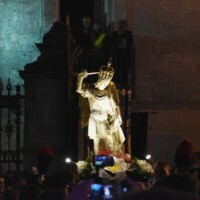 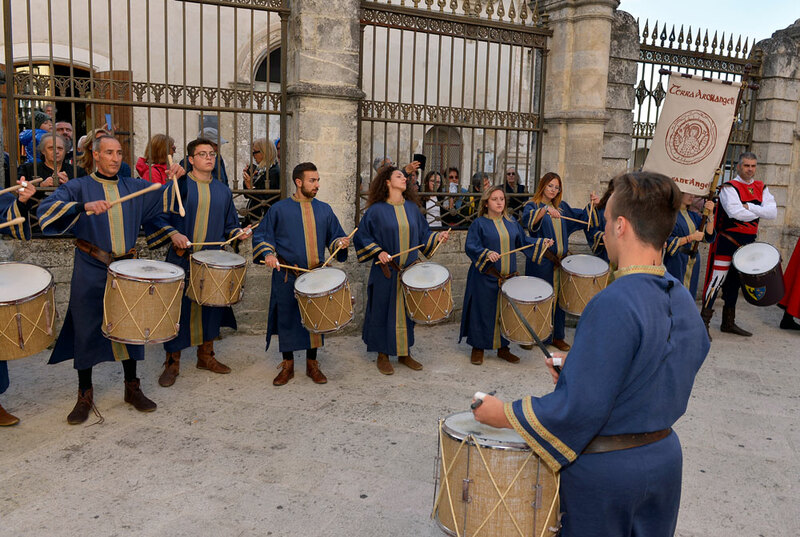 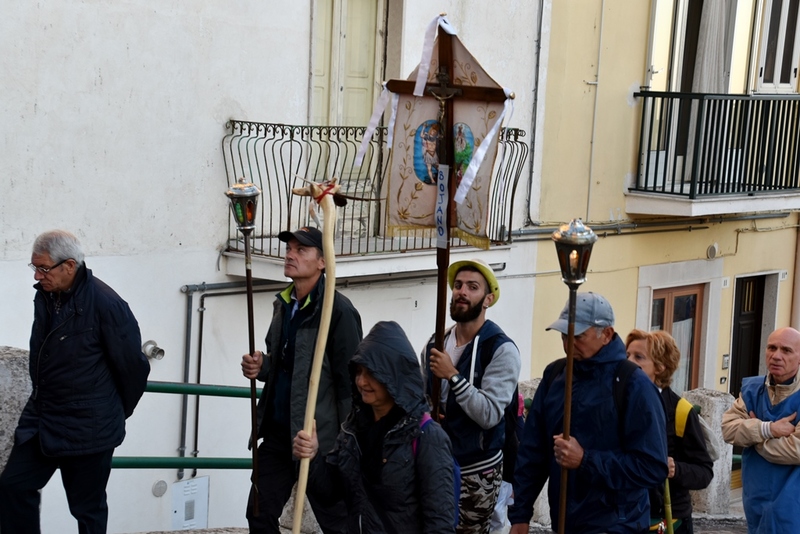 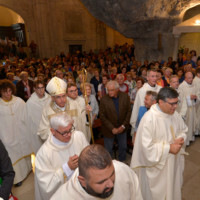 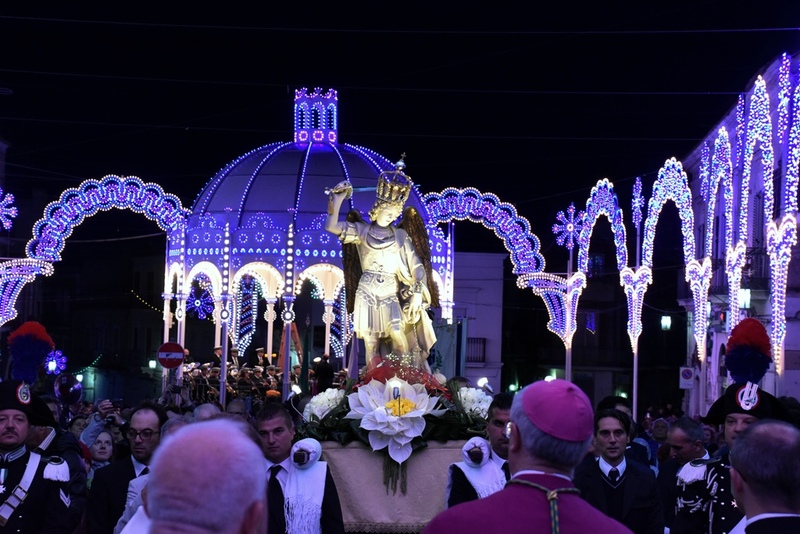 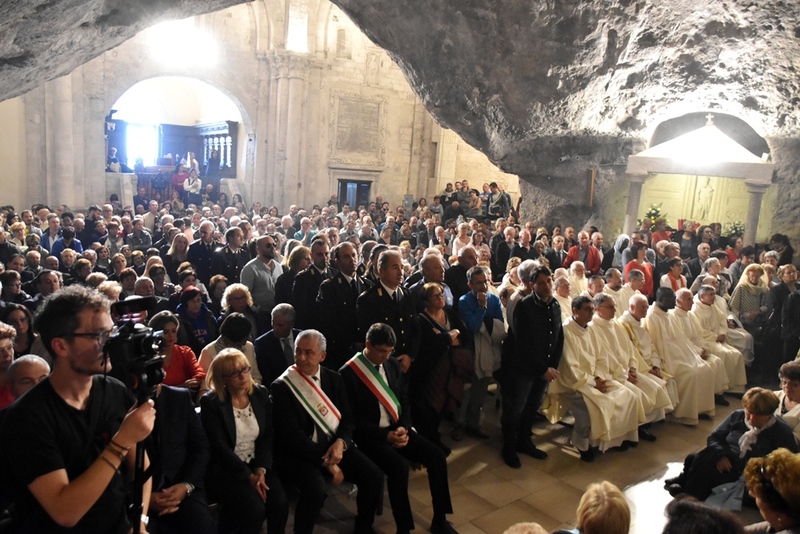 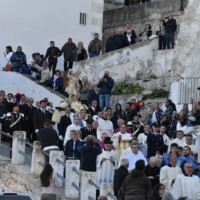 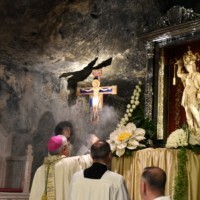 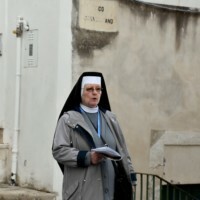 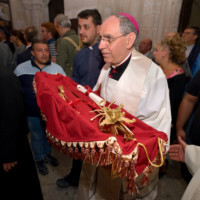 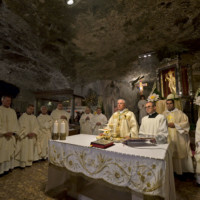 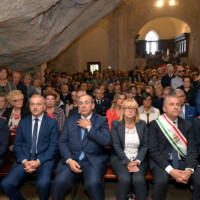 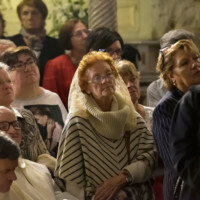 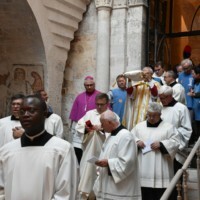 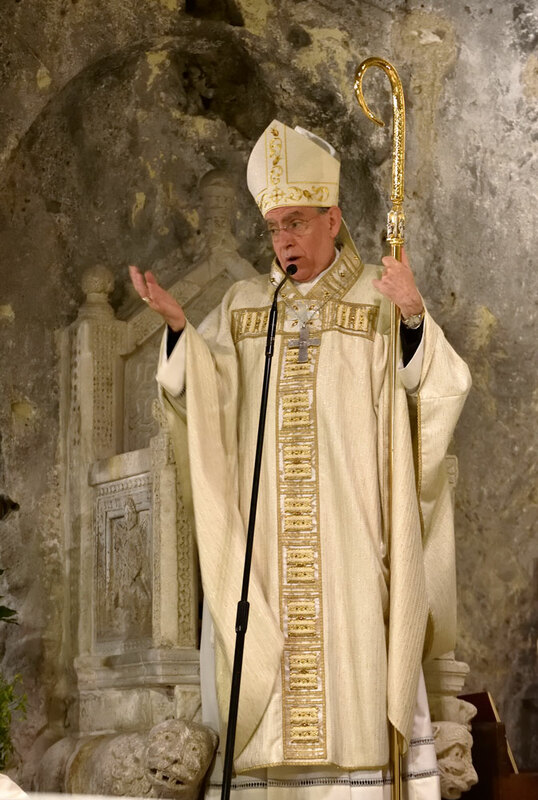 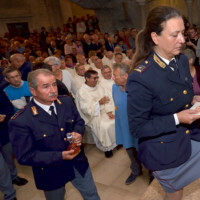 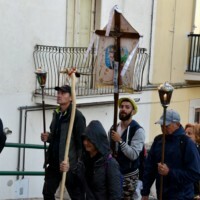 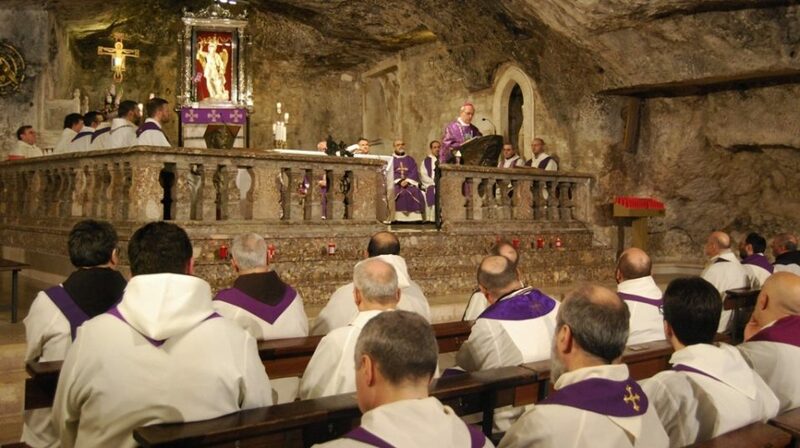 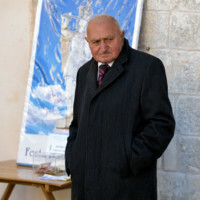 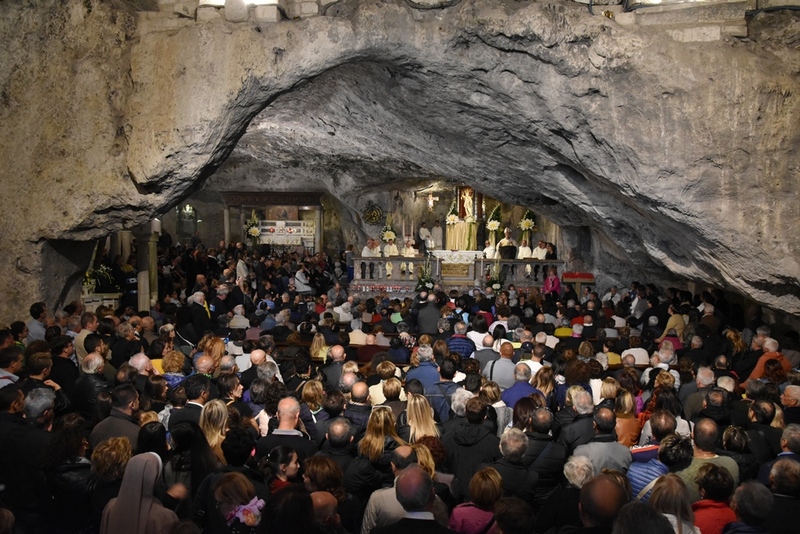 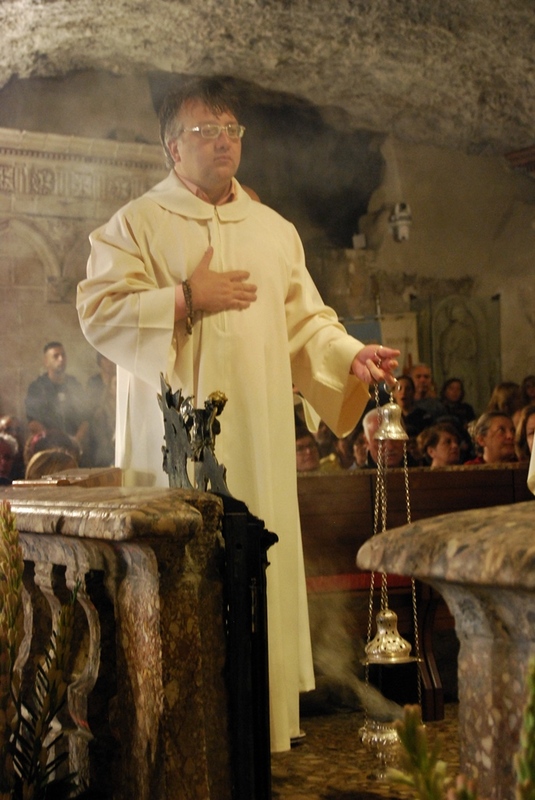 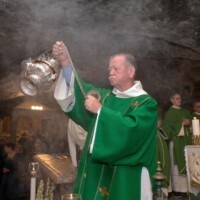 During the novena the ecclesial communities of Monte Sant’Angelo and neighboring cities, together with the many faithful who came from everywhere, took the opportunity to deepen the Christian message illuminated by the light of the Celestial Prince and guided by the meditations of the preacher, don Gaetano Schiraldi. 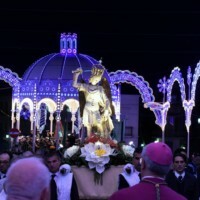 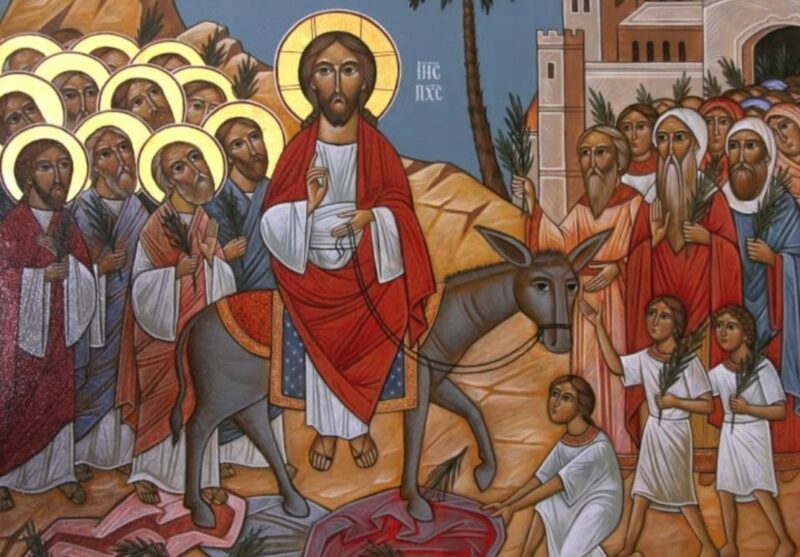 The three days dedicated to the festivities, then, were characterized by specific and significant celebrations. 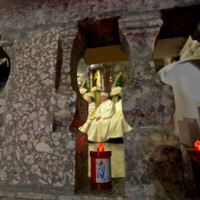 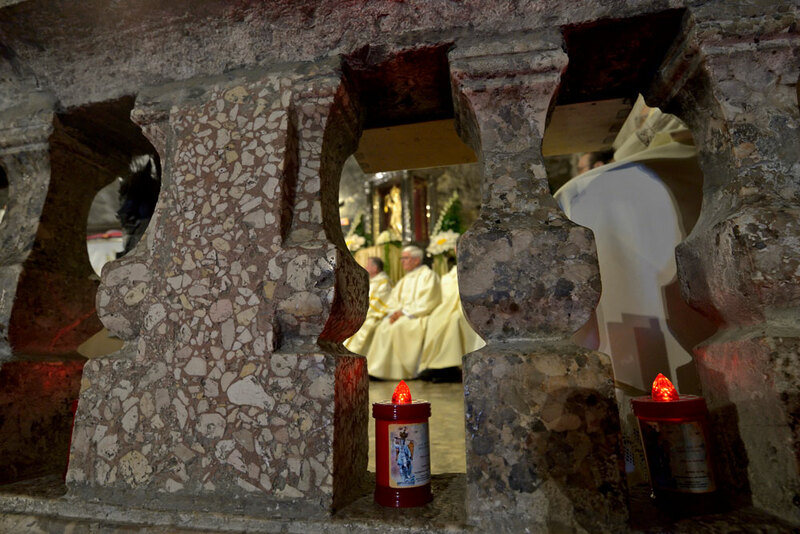 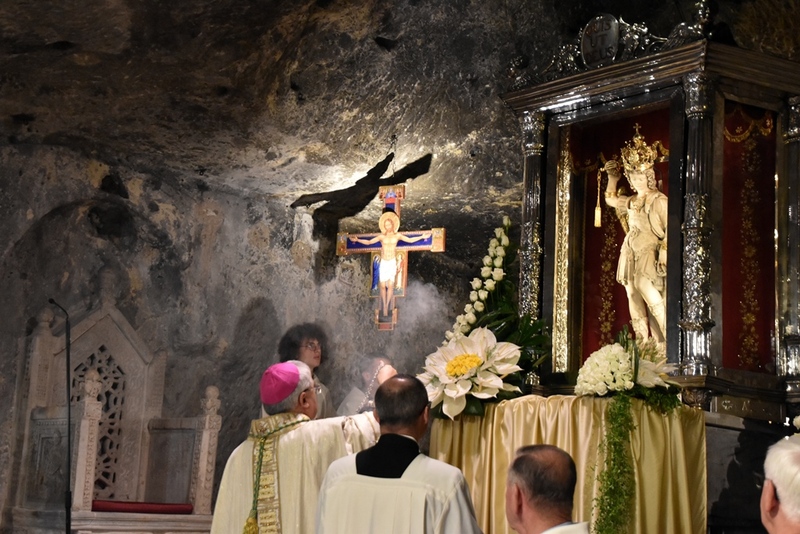 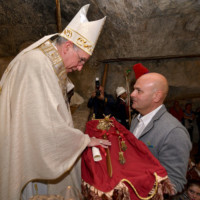 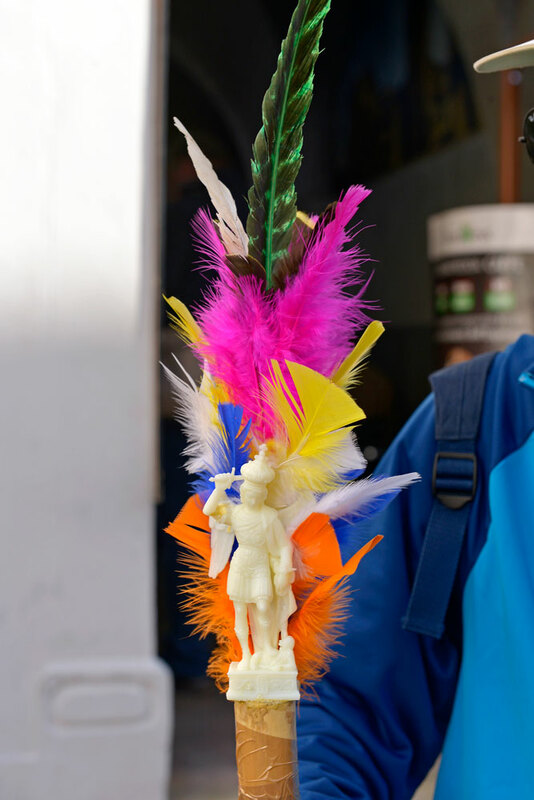 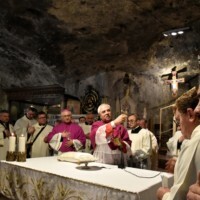 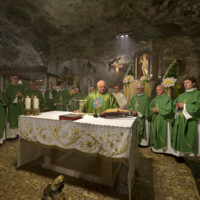 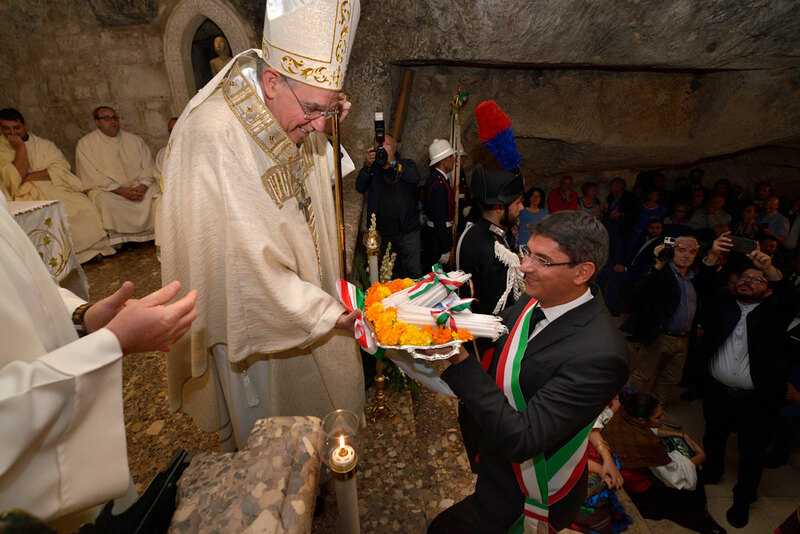 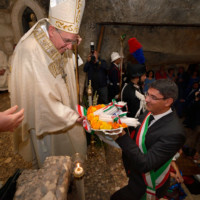 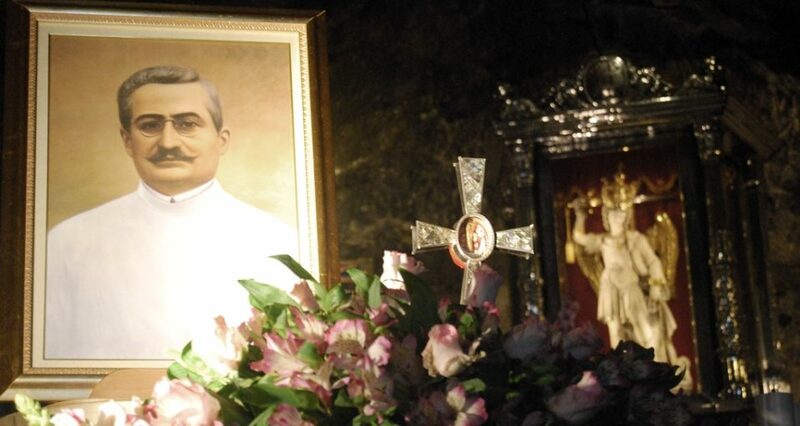 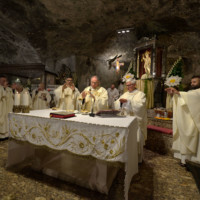 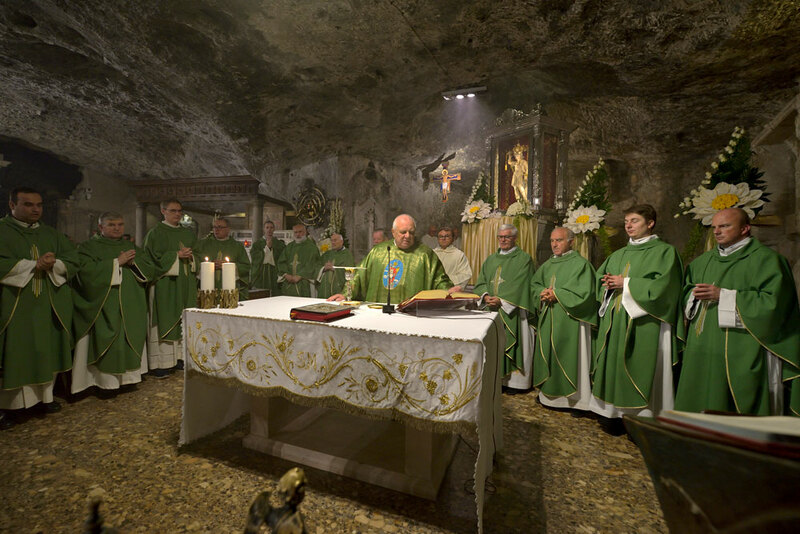 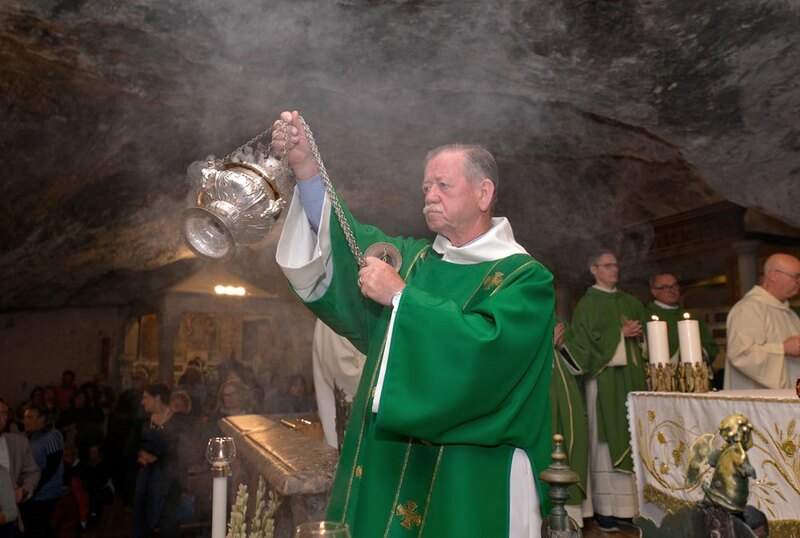 On September 28th, the Vigil, the City, represented by its governing bodies, presented itself in the Holy Pilgrim Grotto in the benevolent intercession of the Patron Saint: the delivery of the wax during the offertory symbolized the act of lighting an ideal votive candle. 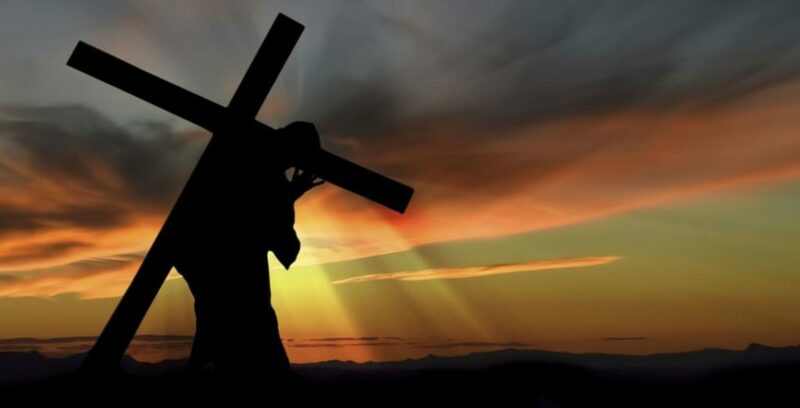 on behalf of the whole Community. 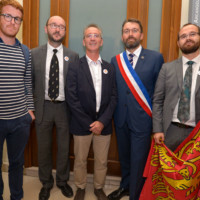 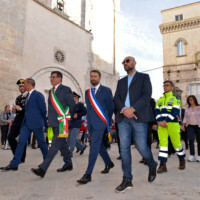 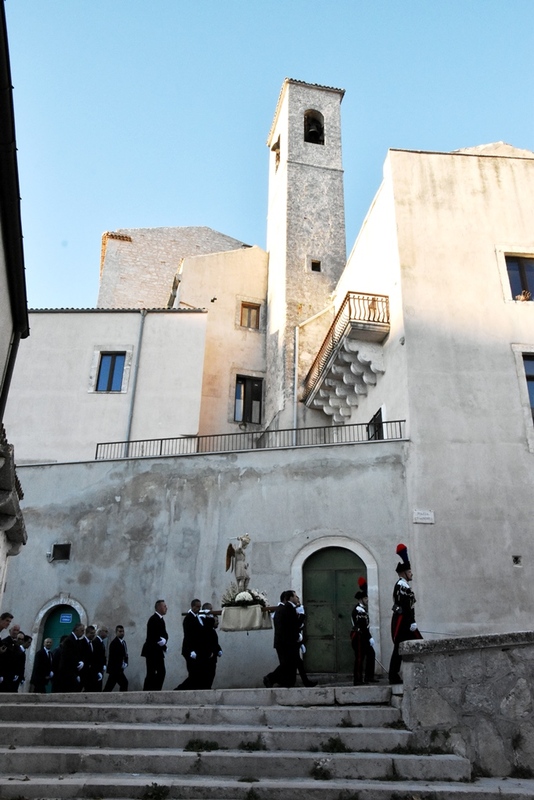 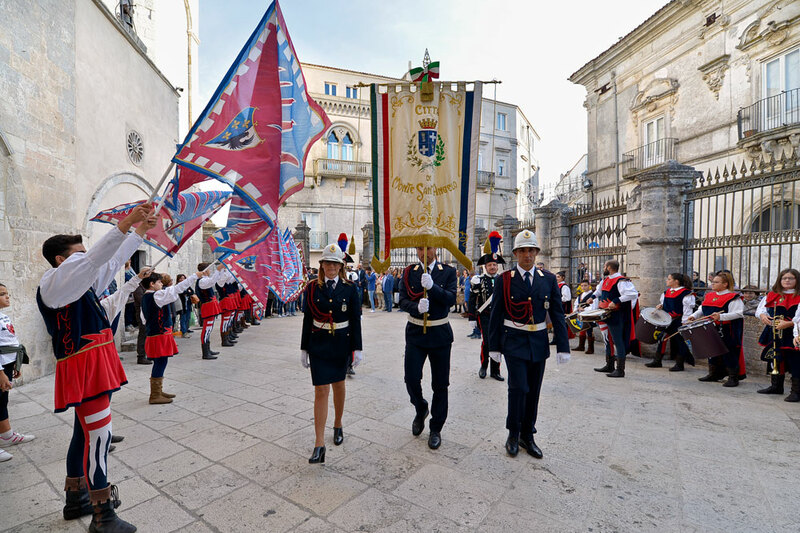 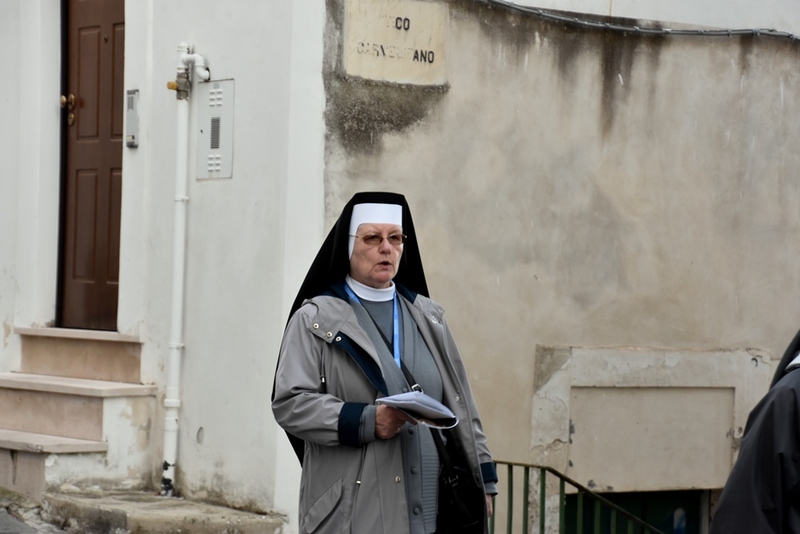 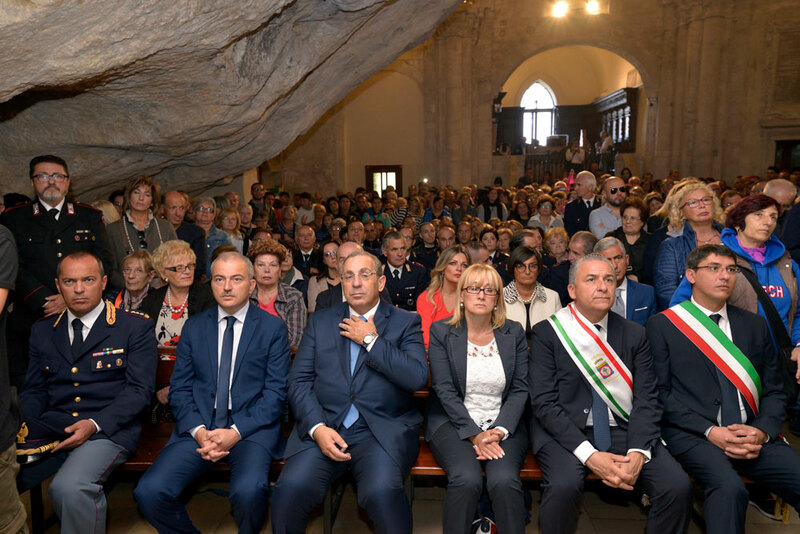 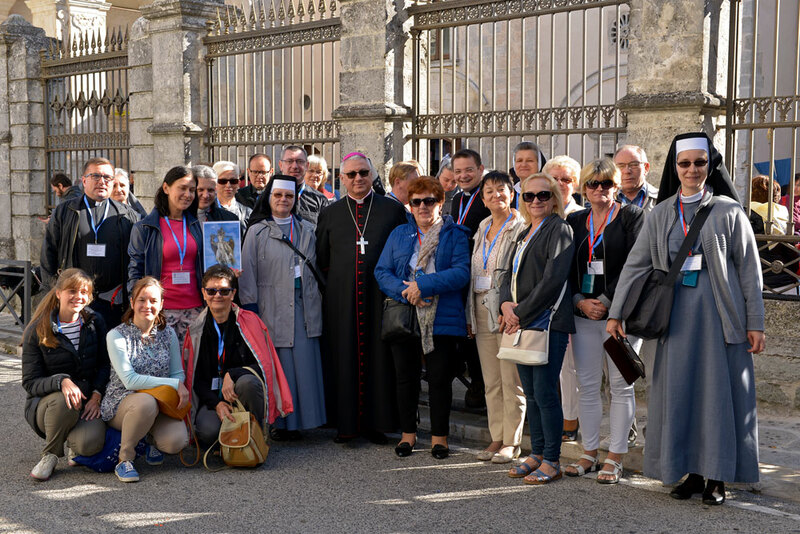 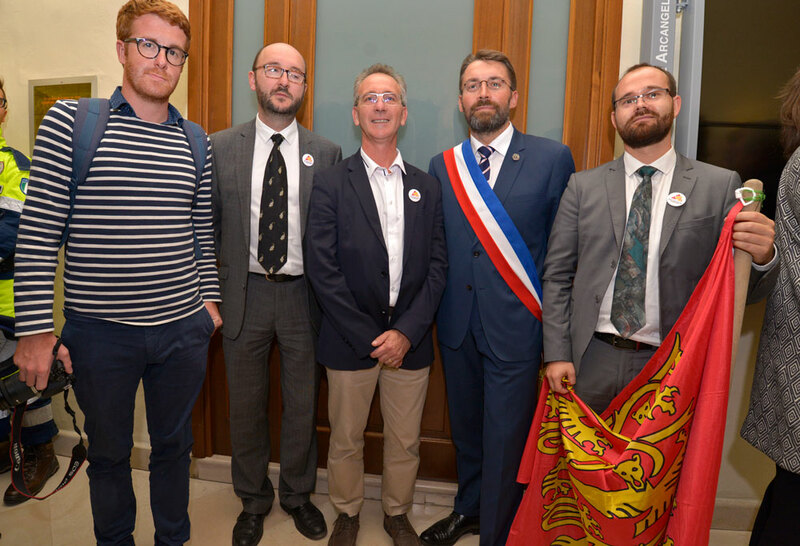 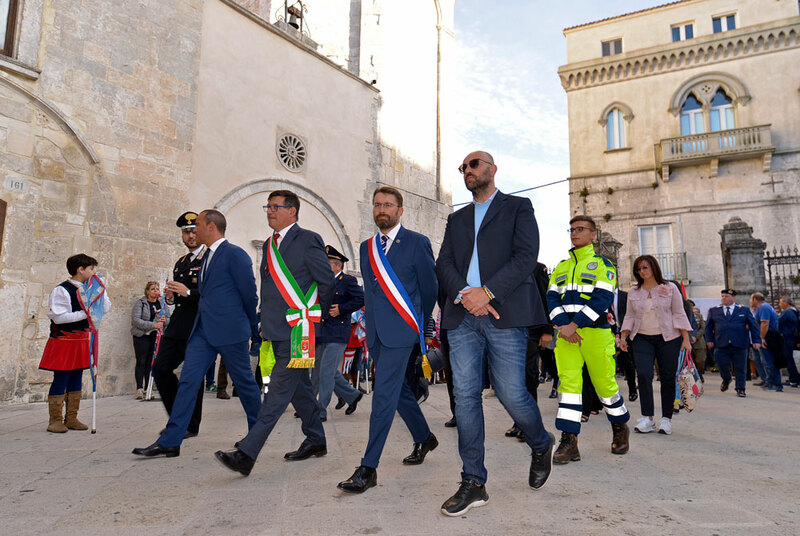 Furthermore, the municipal administration was flanked by two delegations from Mont Saint Michael and Nova Milanese. 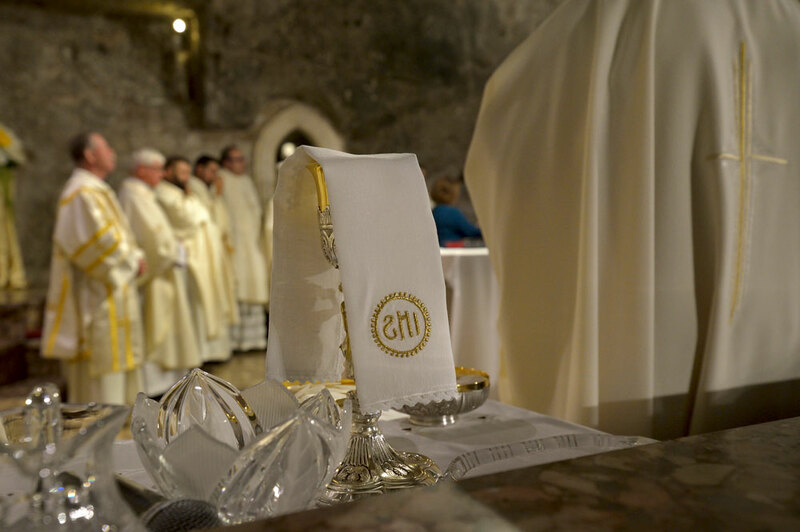 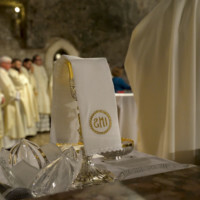 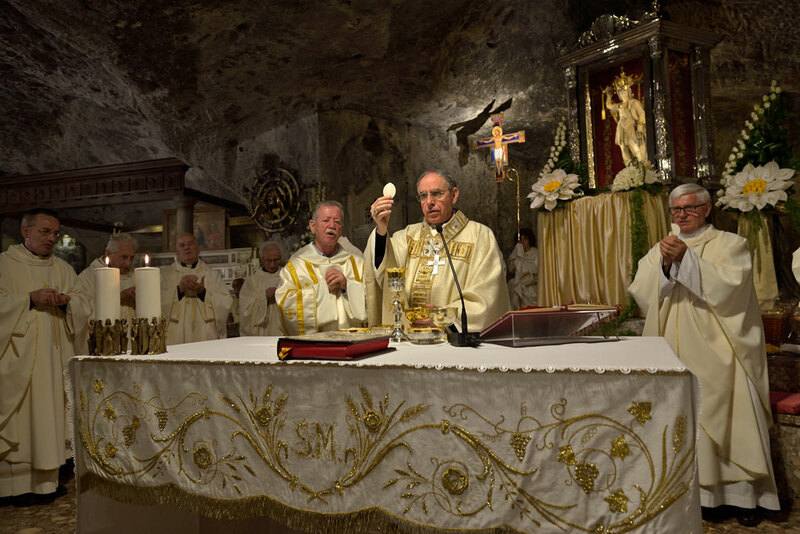 The solemn Eucharistic Concelebration was presided by Mons. 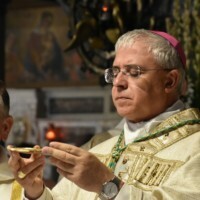 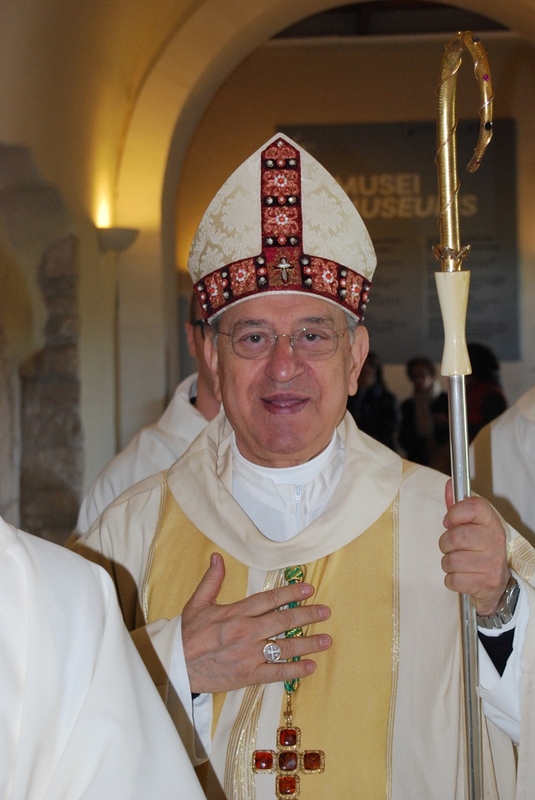 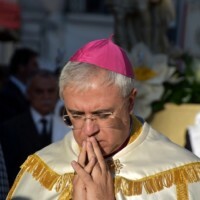 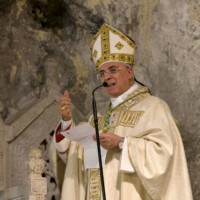 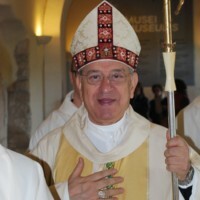 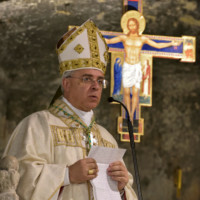 Giacomo Cirulli, Bishop of Teano – Calvi. 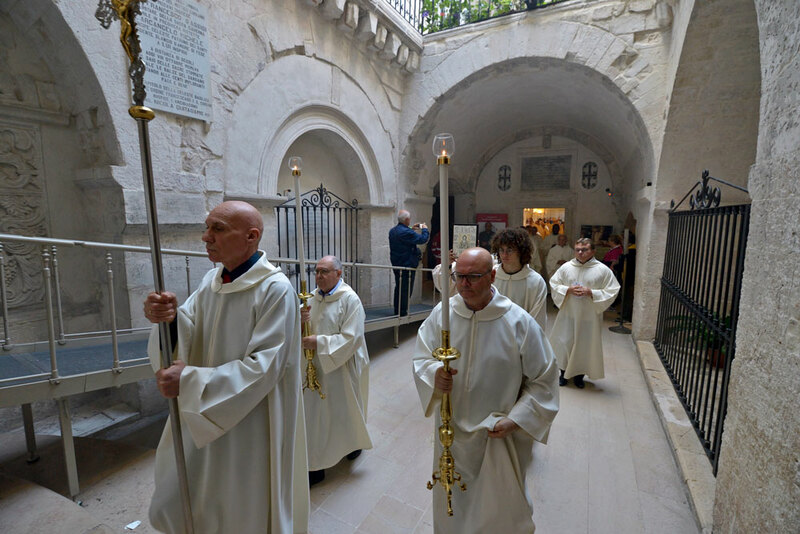 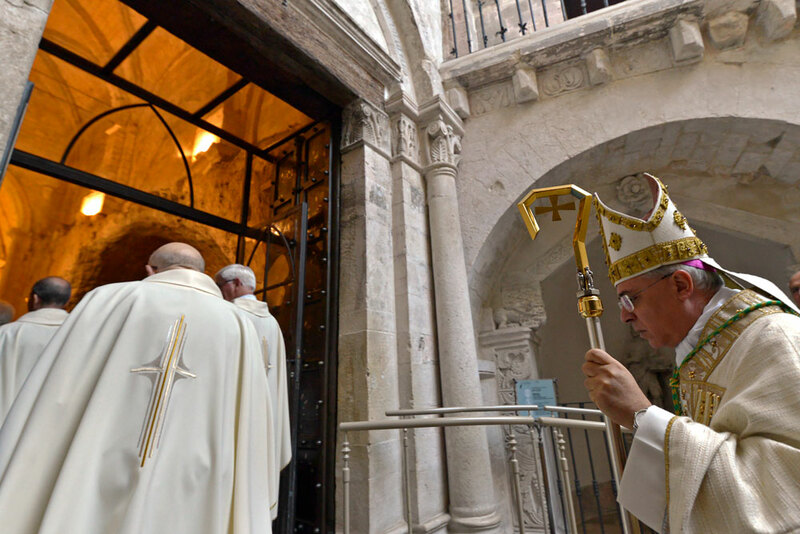 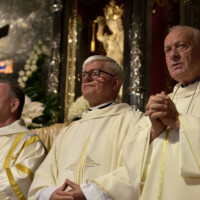 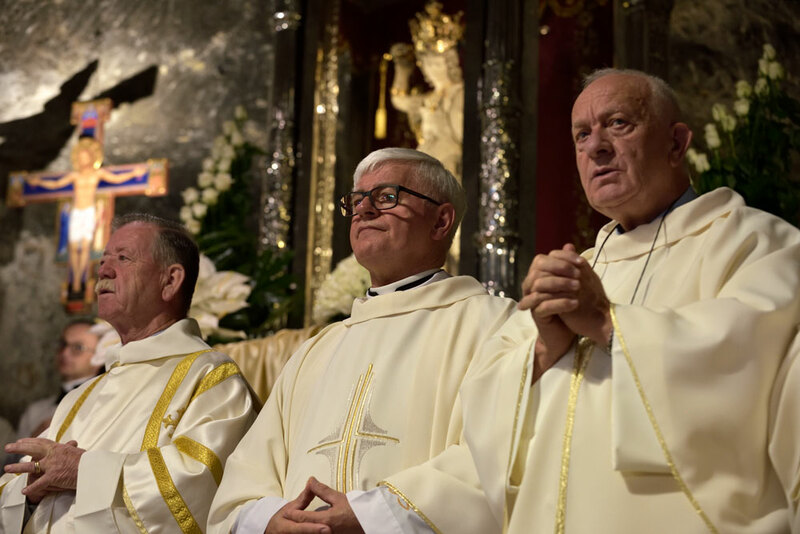 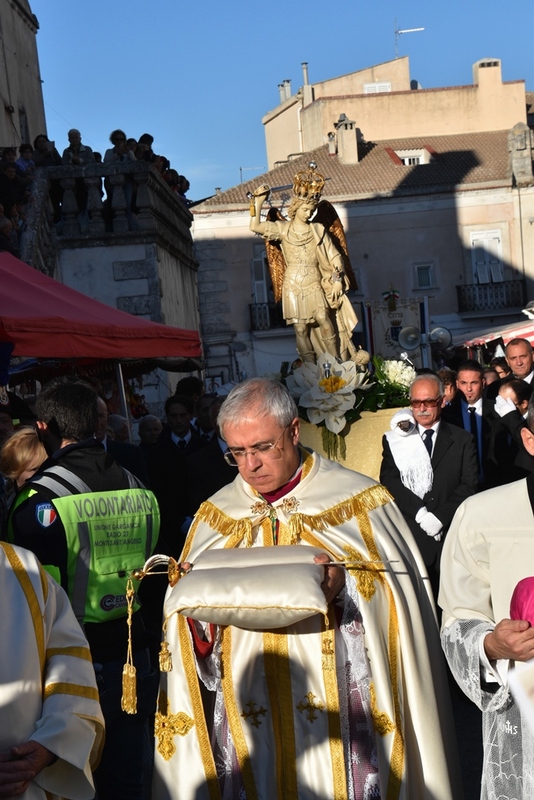 At the end of the Mass, the prelate also attended the “laying of the sword” ceremony at the statue of the Archangel located on the facade of the upper Atrium of the Basilica. 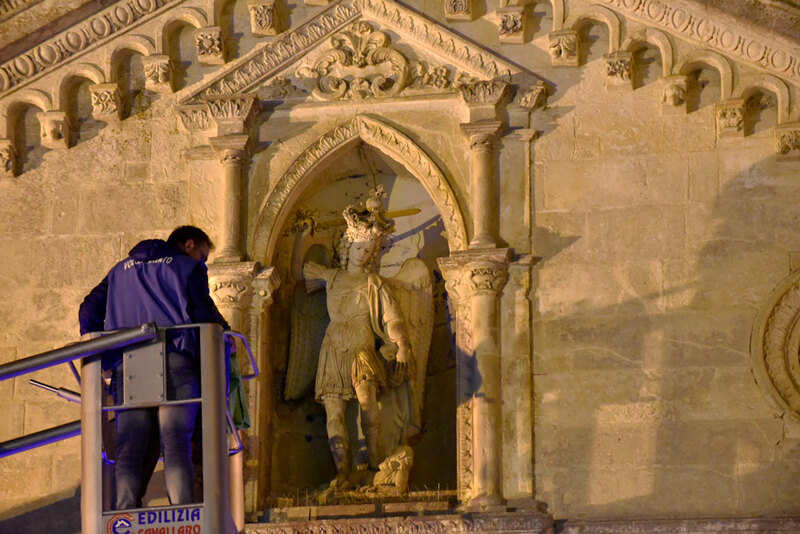 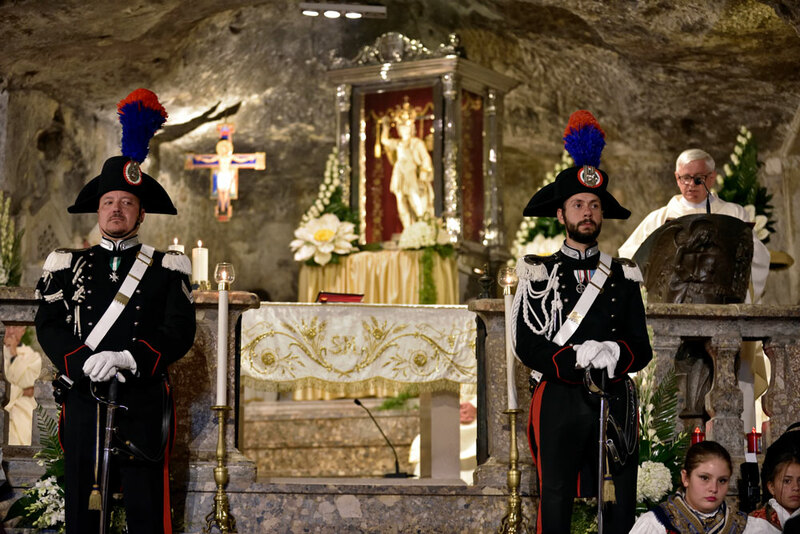 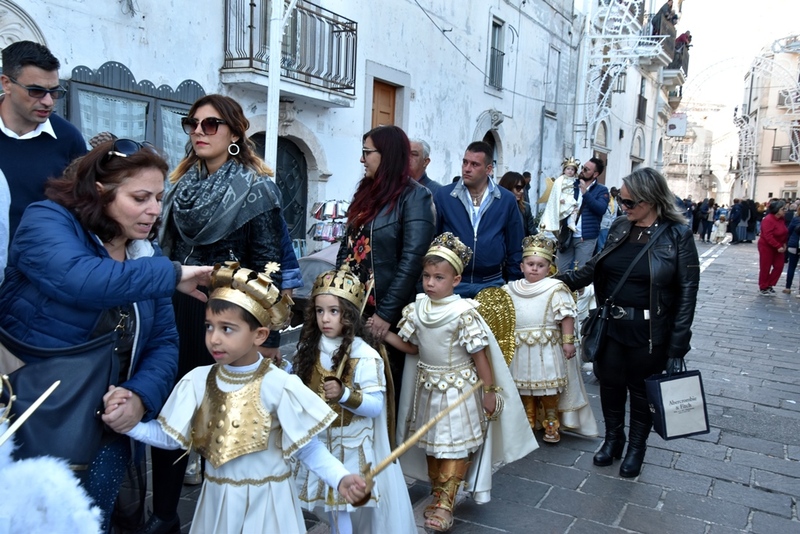 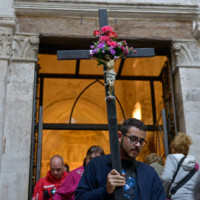 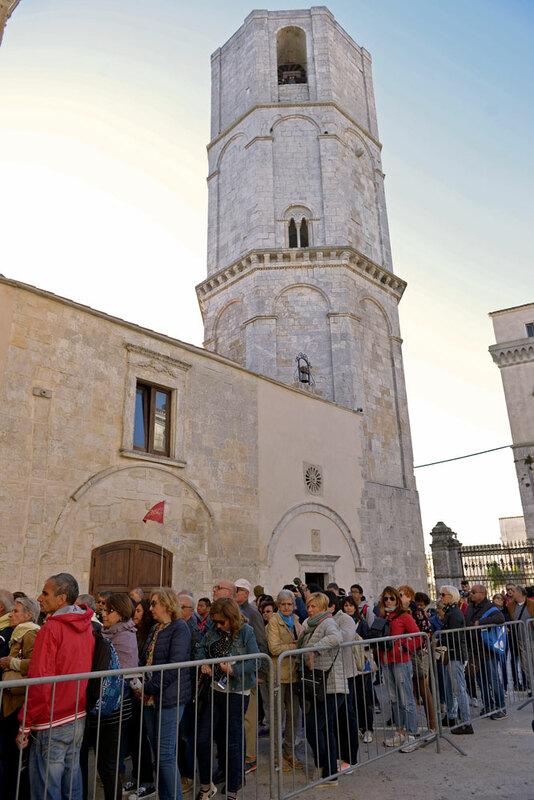 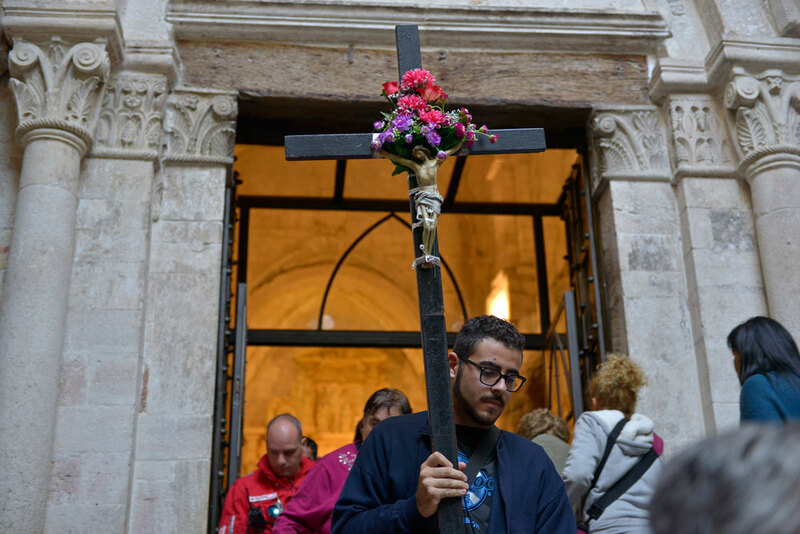 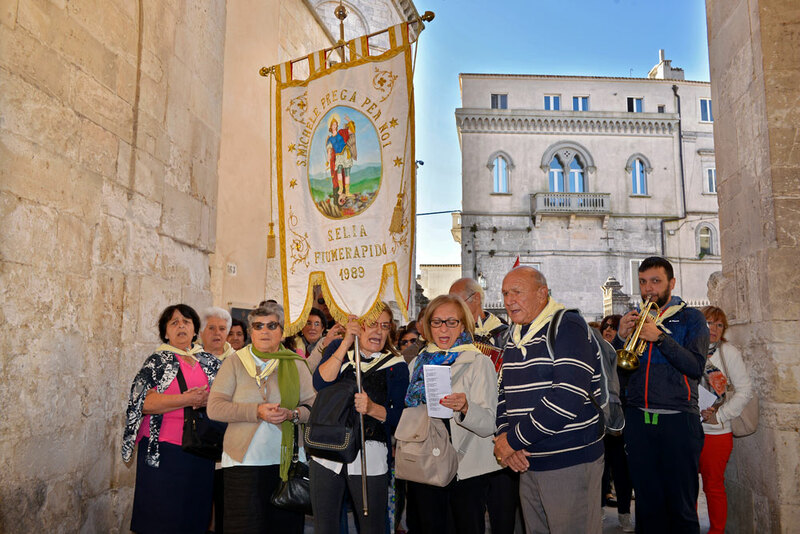 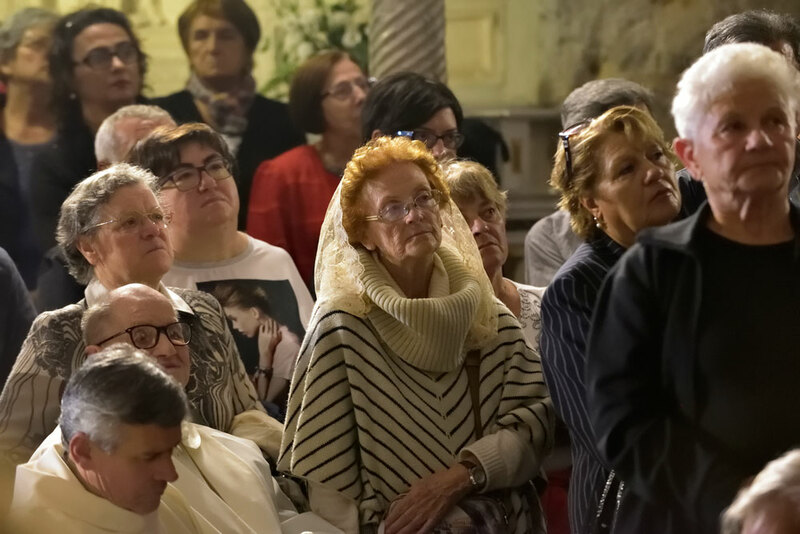 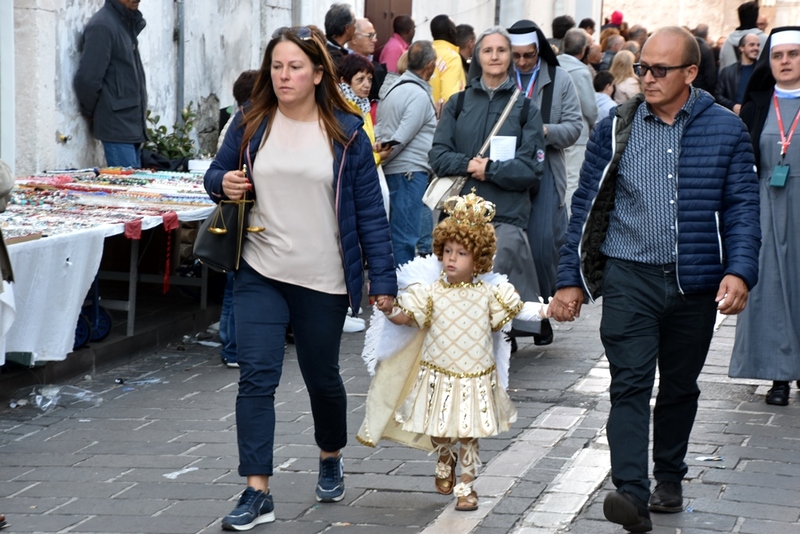 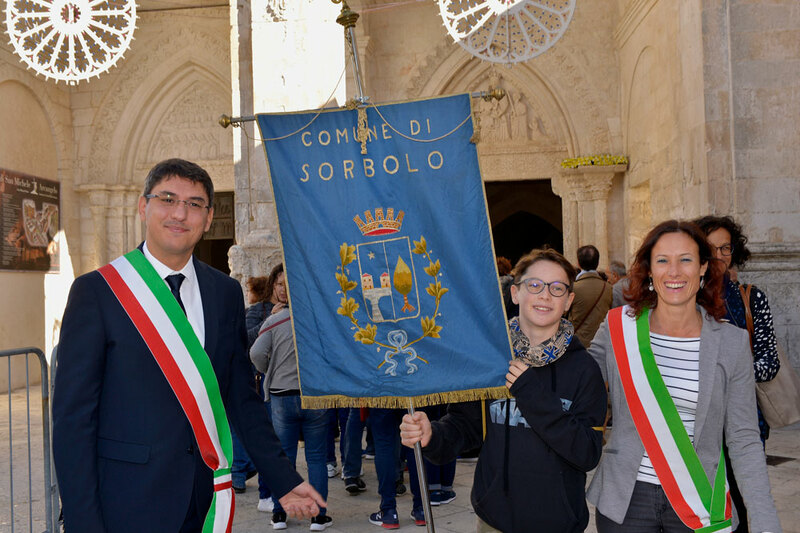 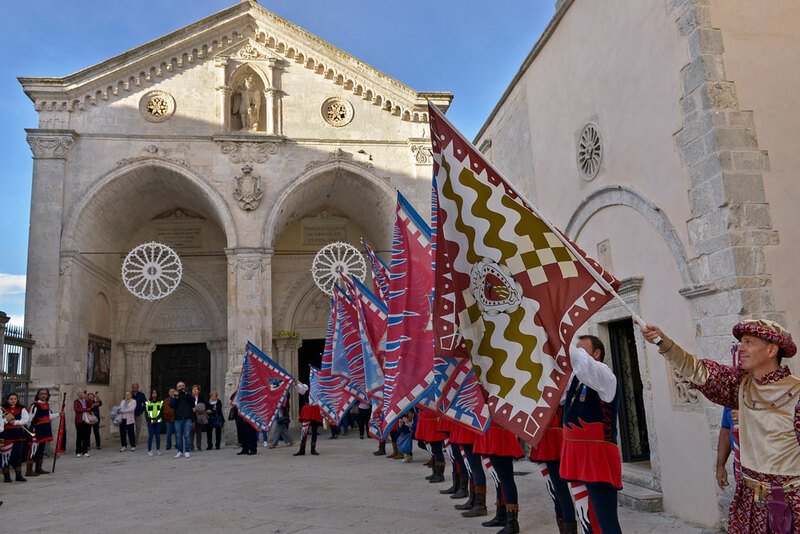 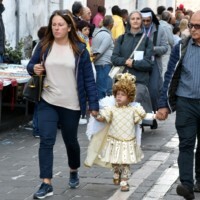 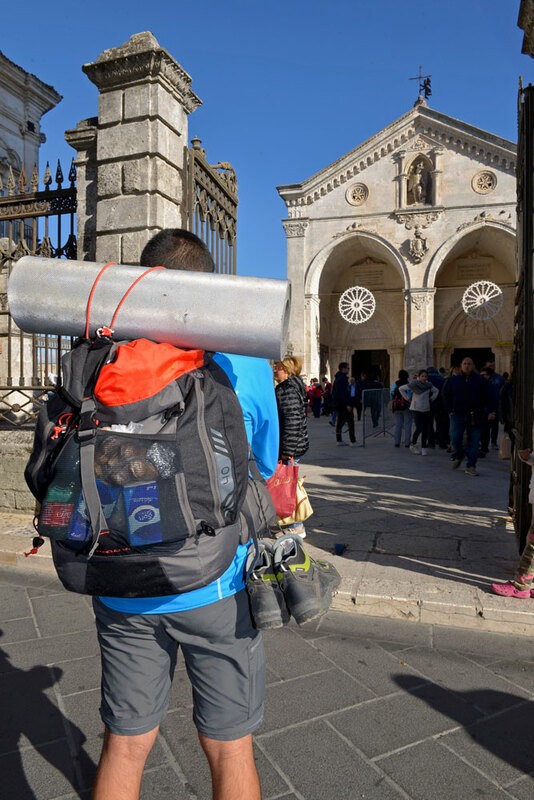 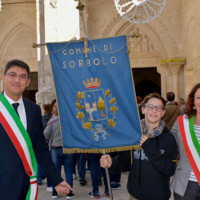 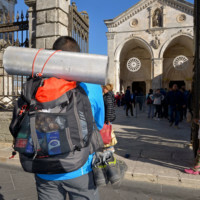 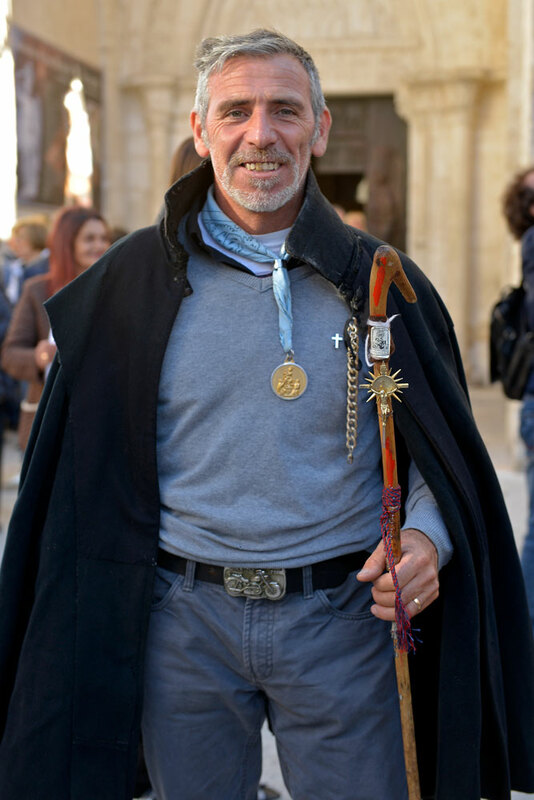 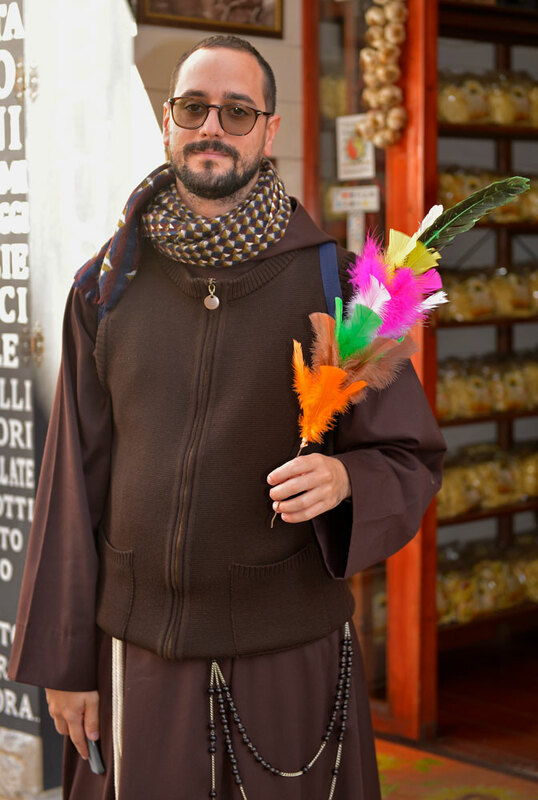 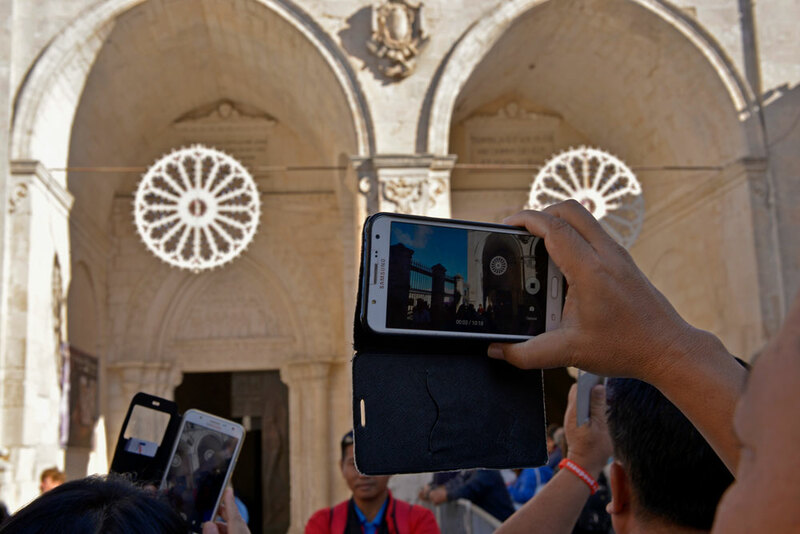 On September 29, the day of the Solemnity, the Sacred Spello was literally “invaded” since the early hours of the morning by many devotees: Italians and foreigners, solitary and in groups or companies, on foot and by means, all eager to meet Michele and honor him. 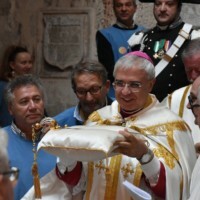 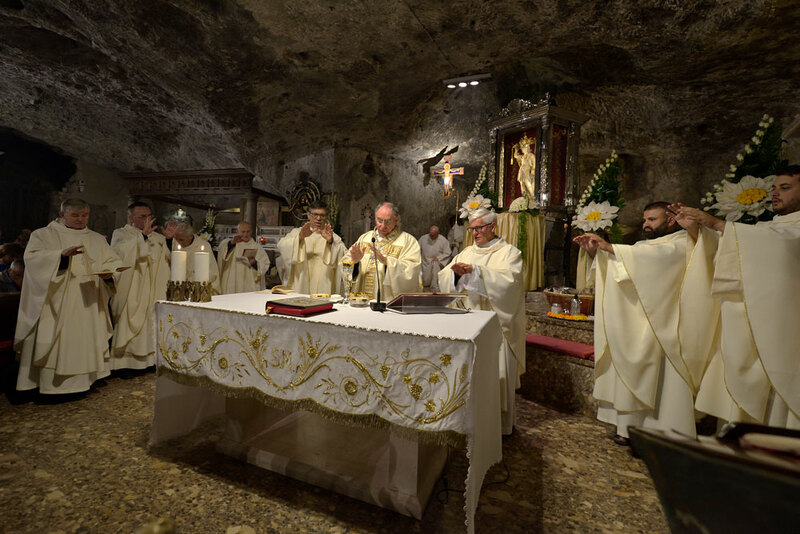 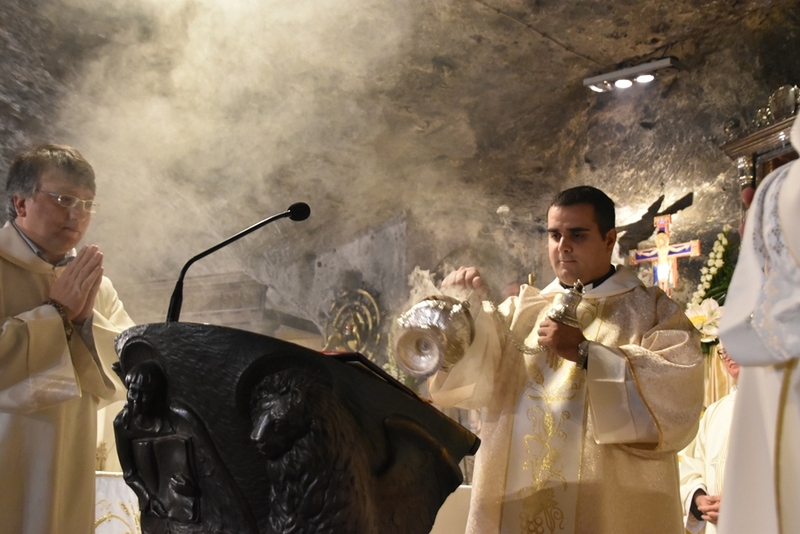 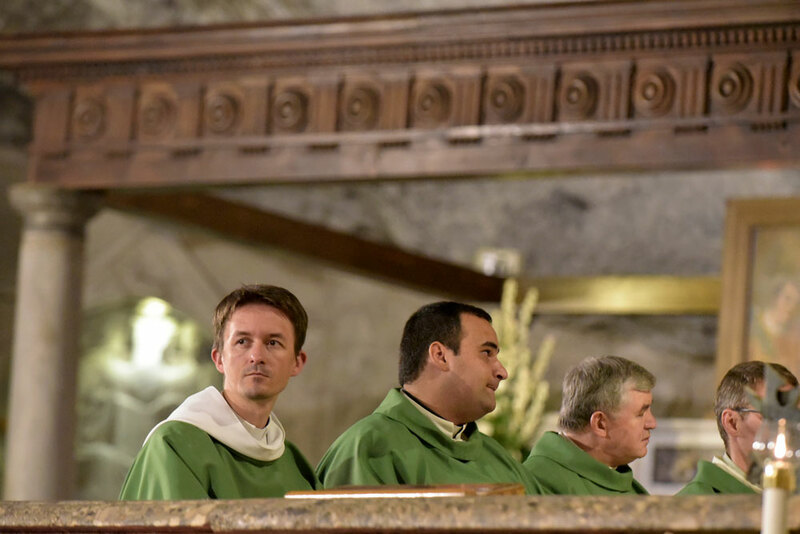 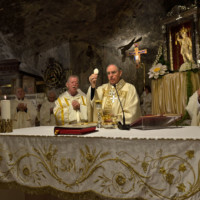 The Divine Eucharist at 10:30 saw the Michelite priests, the parish priests of the City, the priests of the Diocese and foreigners crowning around Monsignor Luigi Renna who presided over the liturgy. 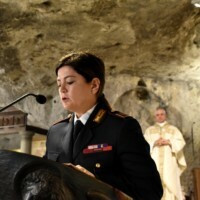 Present the city, provincial and regional civil and military authorities. 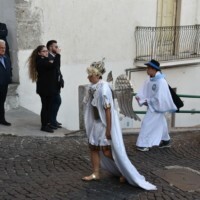 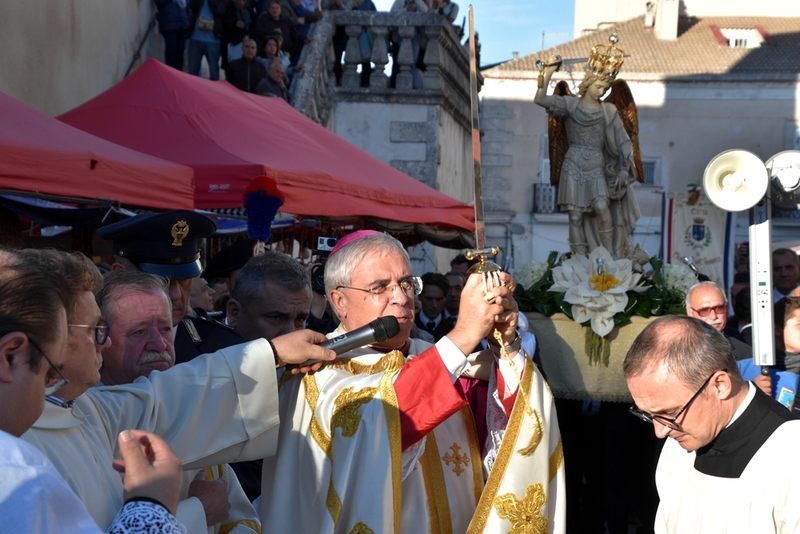 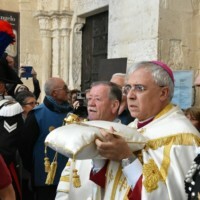 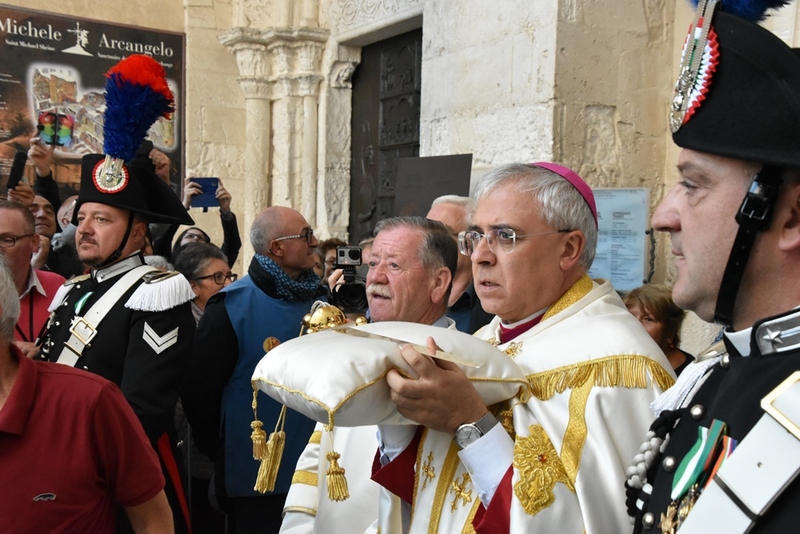 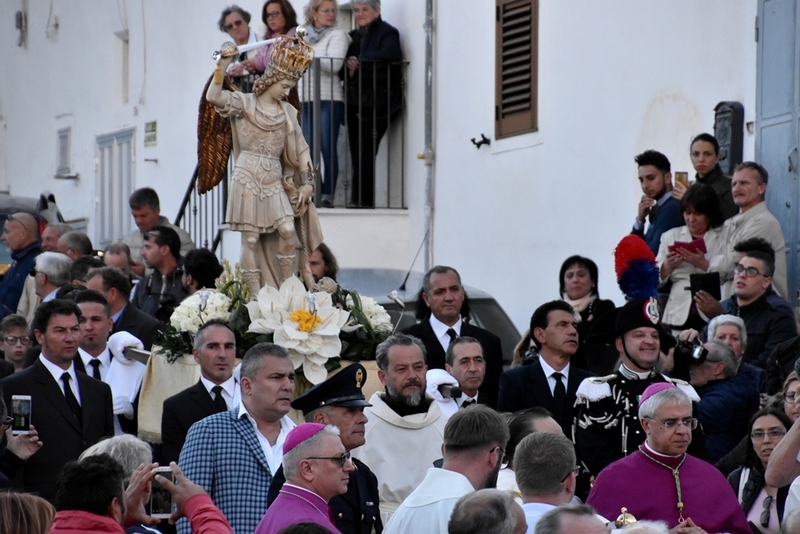 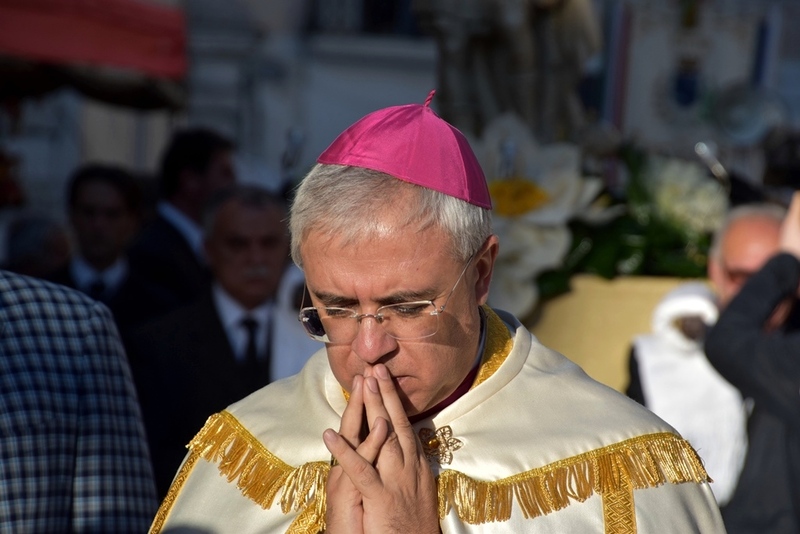 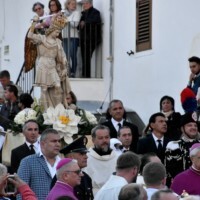 The Bishop of Cerignola – Ascoli Satriano and Apostolic Administrator of Manfredonia – Vieste – San Giovanni Rotondo, in the afternoon also led the procession of the Statue and the Sword of the Archangel: the sacred procession in which the Angelico Patrono “goes out” to meet to bless his sons through the streets of Monte Sant’Angelo. 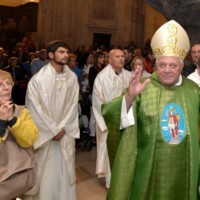 Next to Mgr. 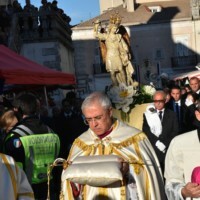 Renna there was another bishop: Mgr. 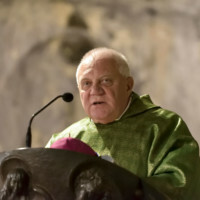 Artur Grzegorz Miziński, Secretary of the Polish Bishops’ Conference. 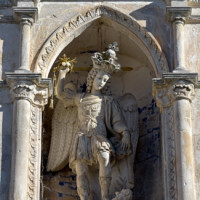 September 30th is now considered for some years as the closing of the festivities and the time to thank St. Michael for all the benefits bestowed. 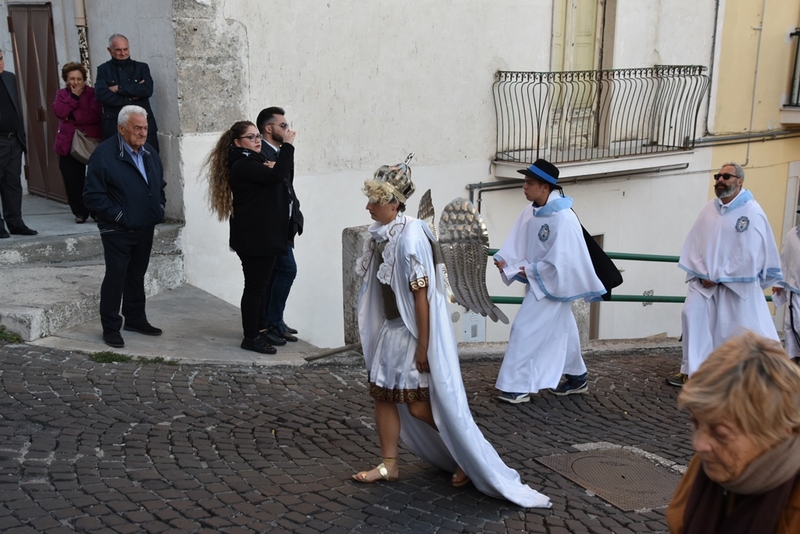 Falling this year on Sunday, this day has assumed an even more important role becoming a sort of extension of September 29 for all those who, for various reasons, could not venerate the beloved Angel in his Feast. 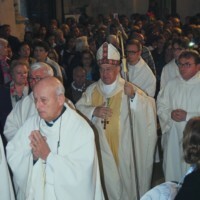 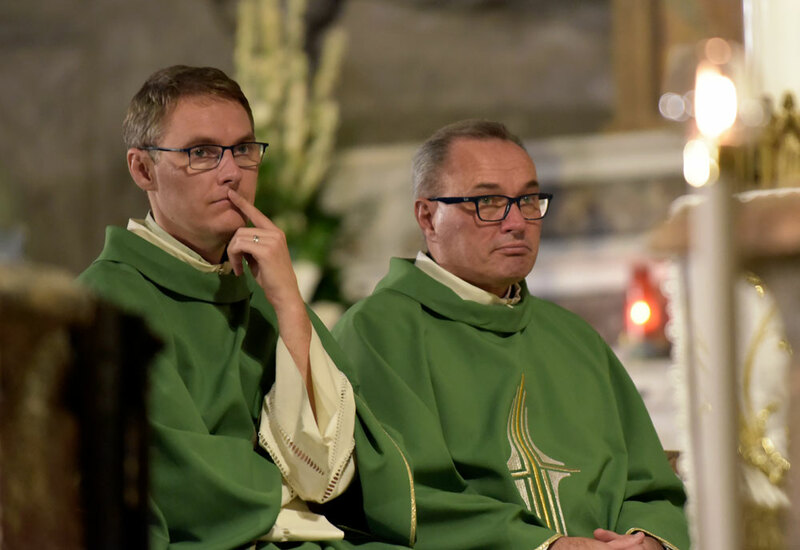 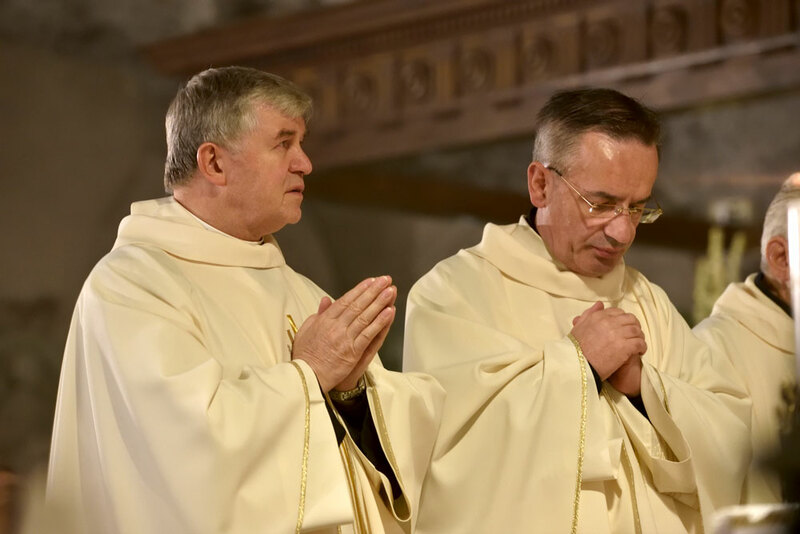 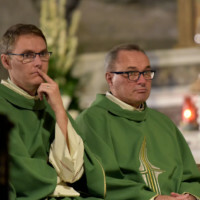 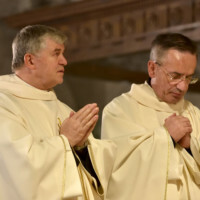 The major celebrations recorded the participation of two bishops: in the morning, Mons. 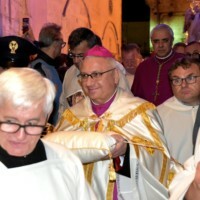 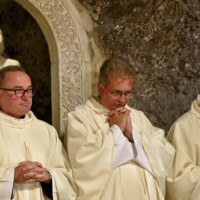 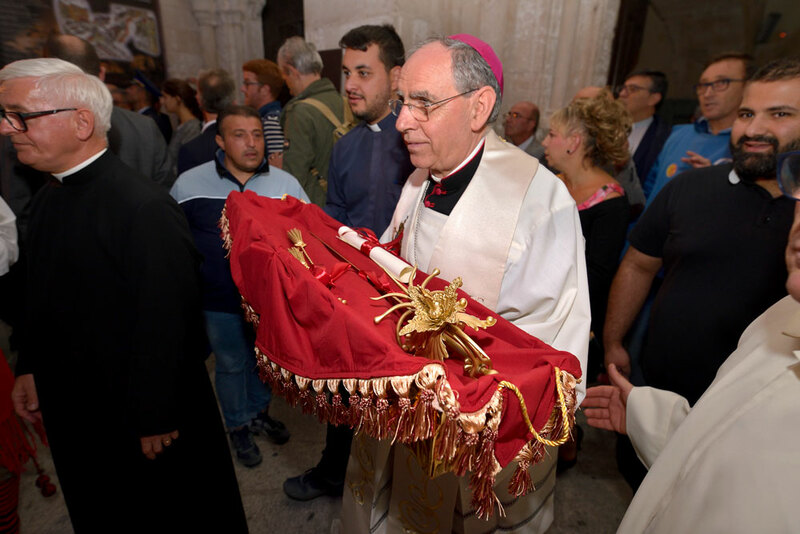 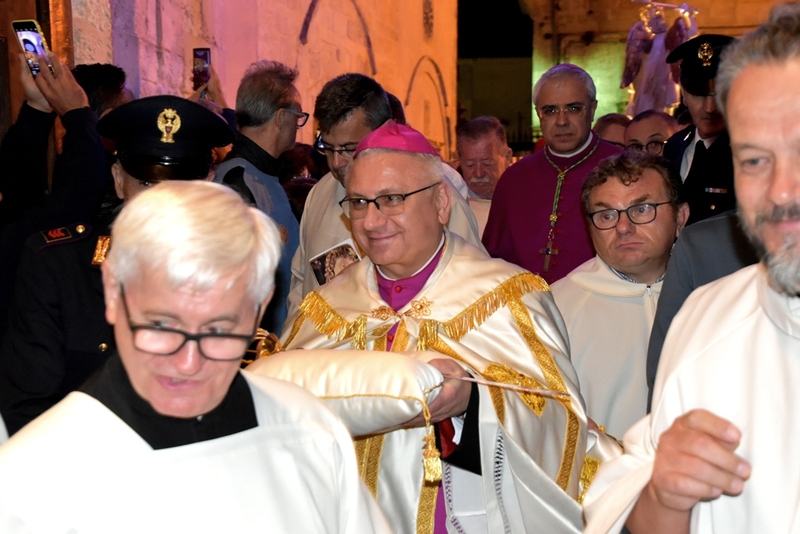 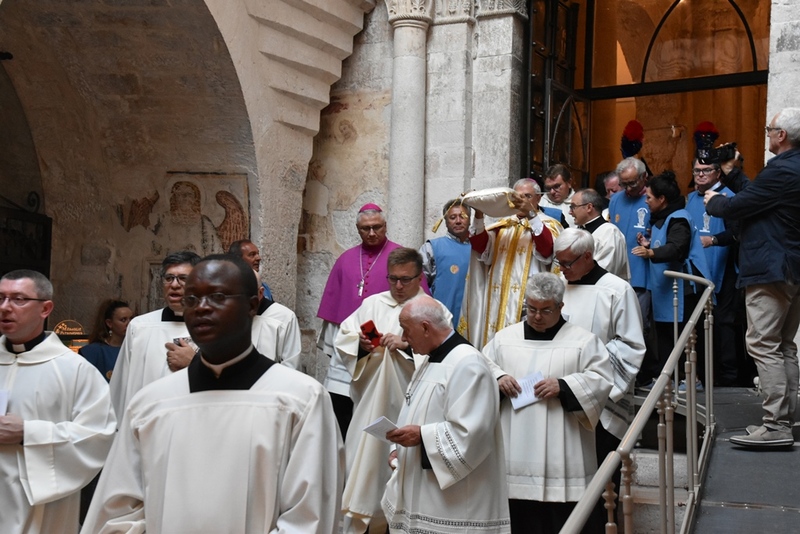 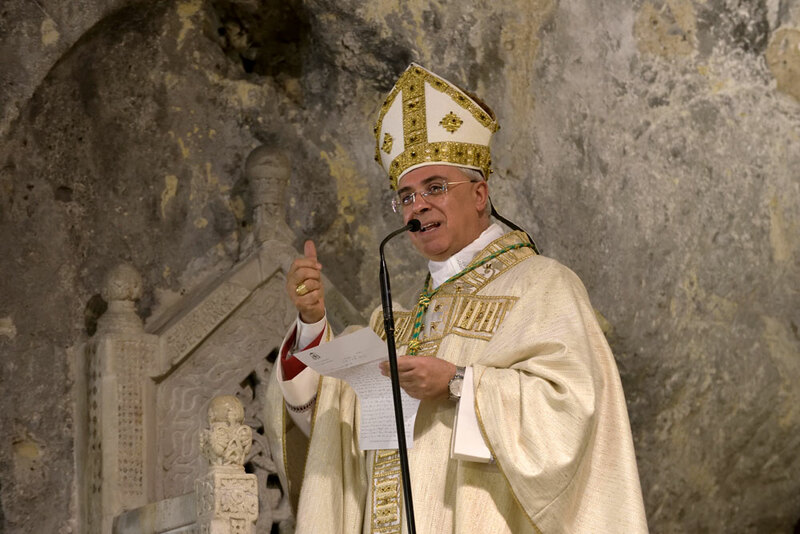 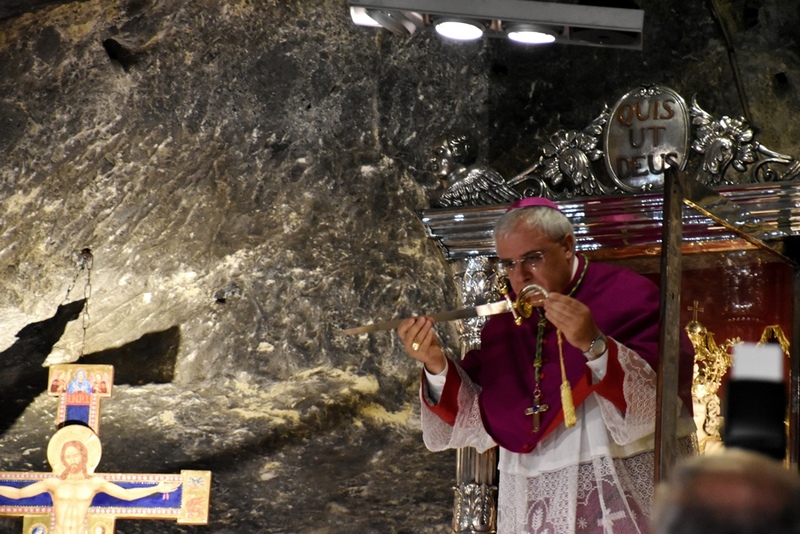 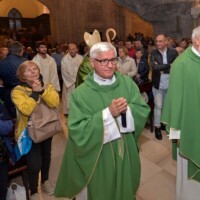 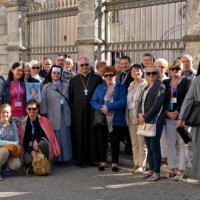 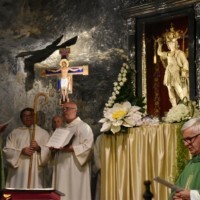 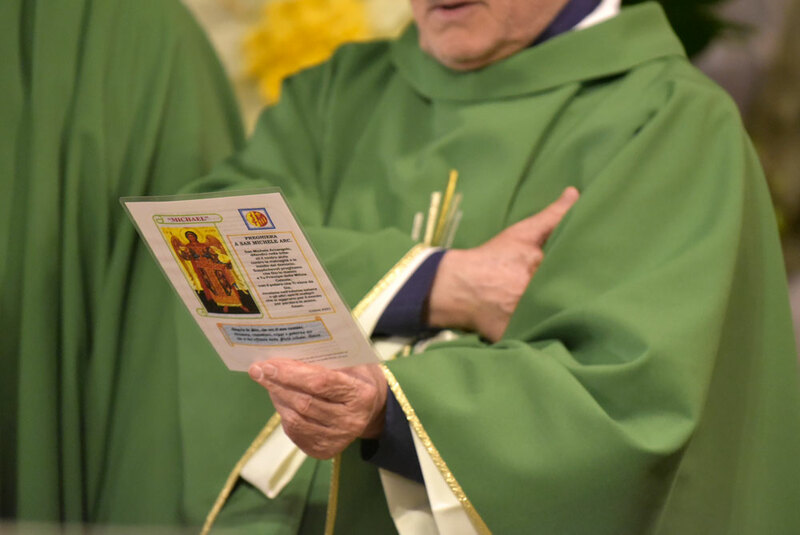 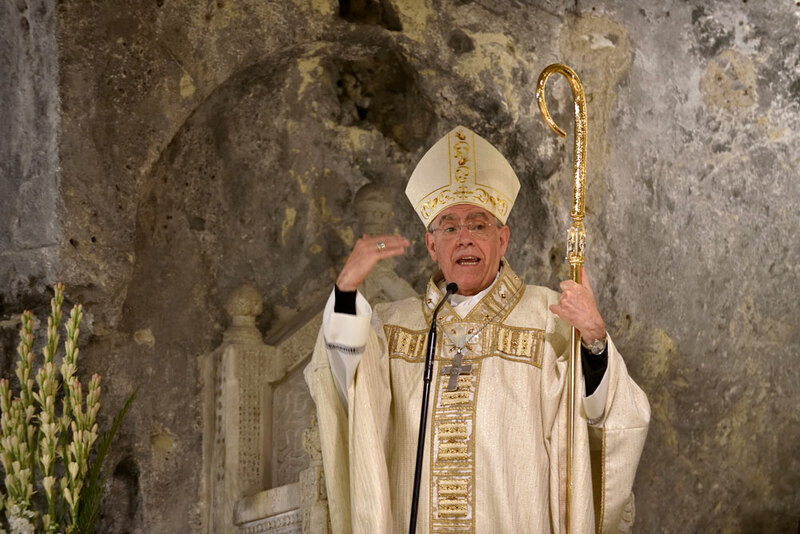 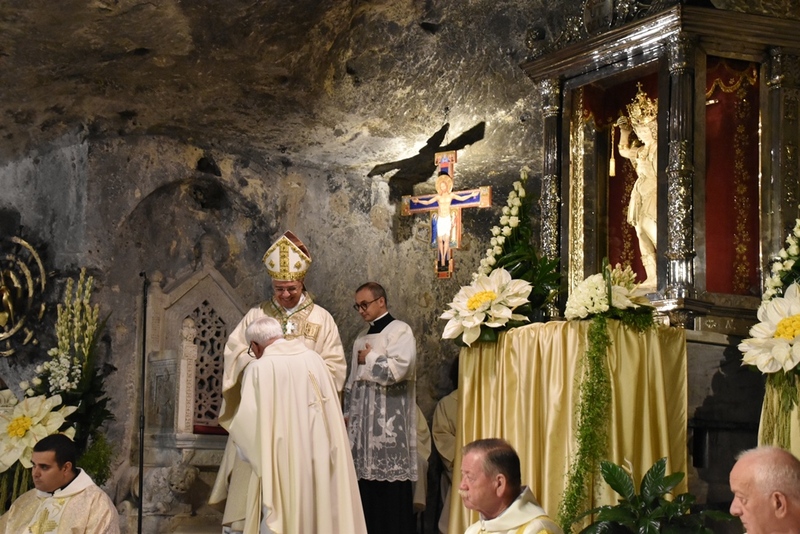 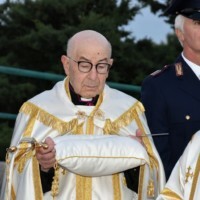 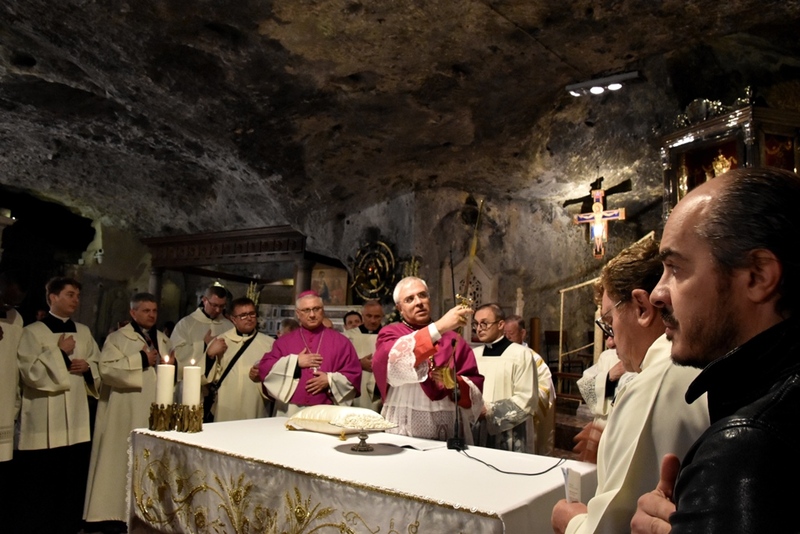 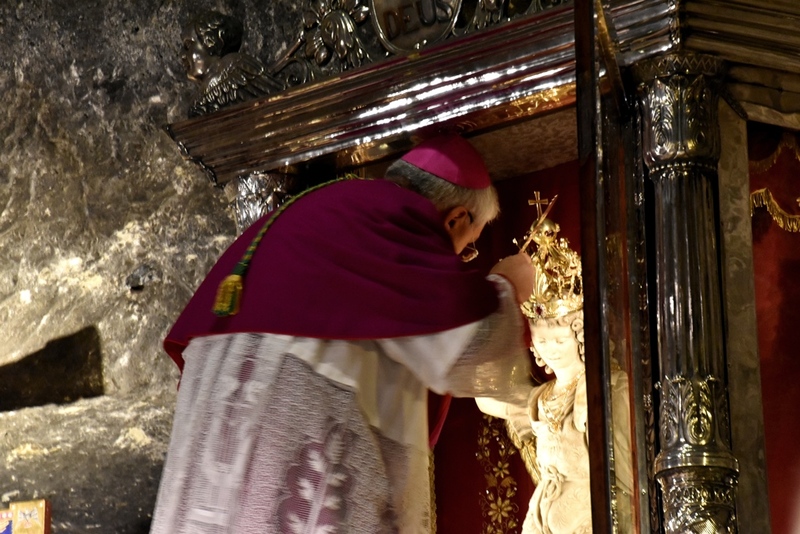 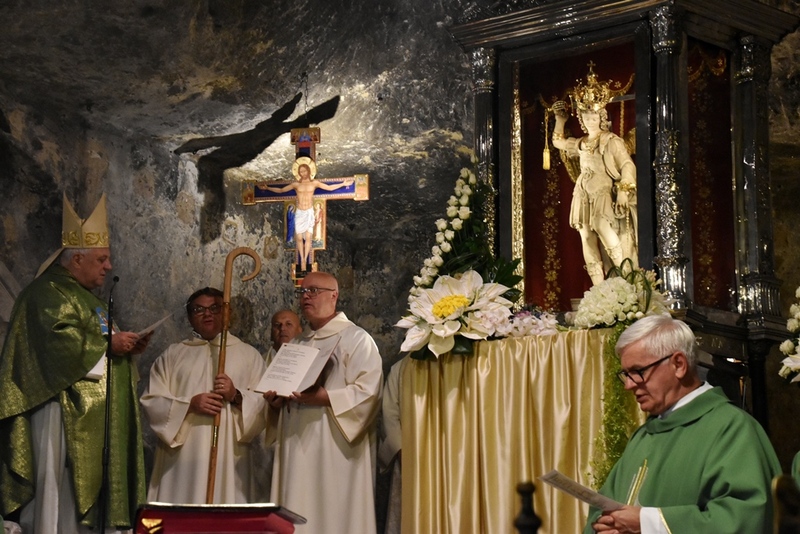 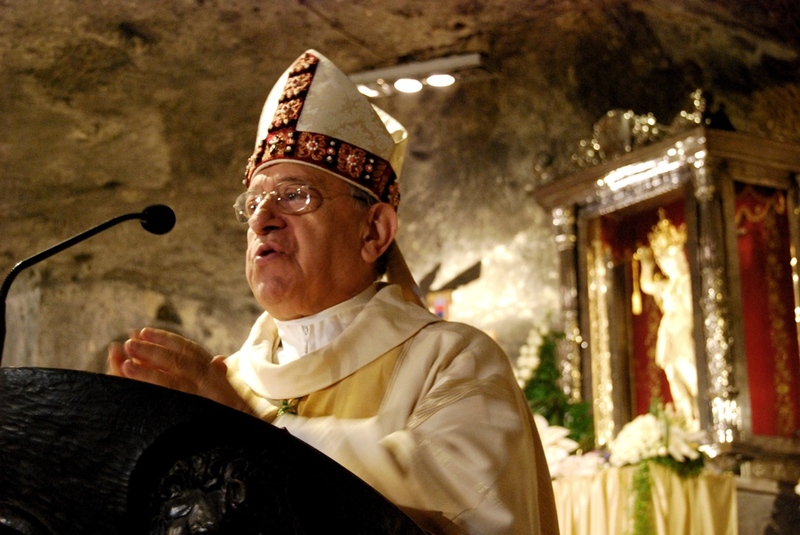 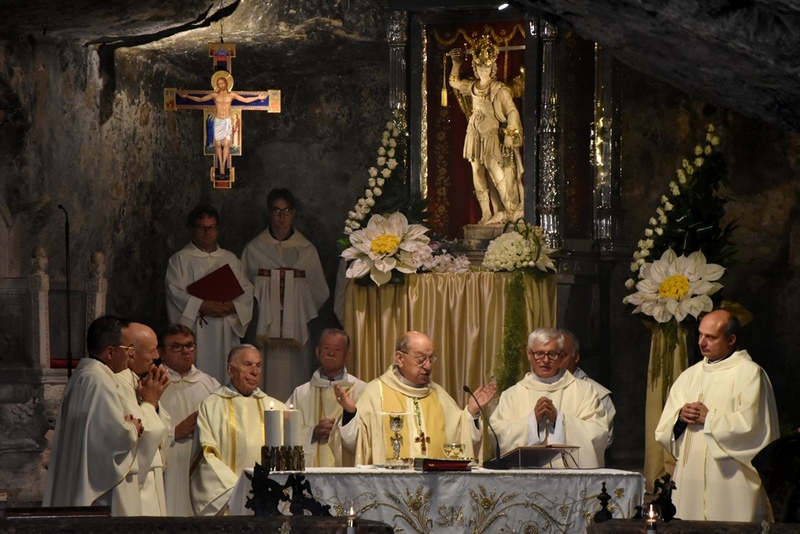 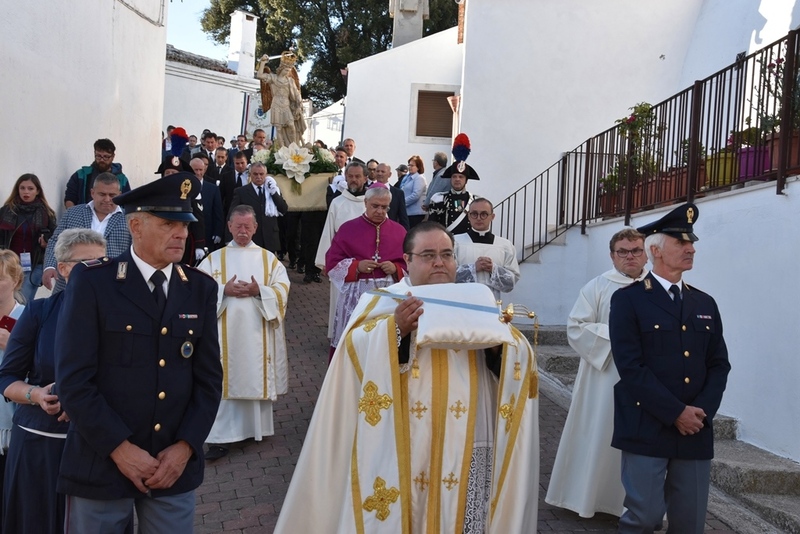 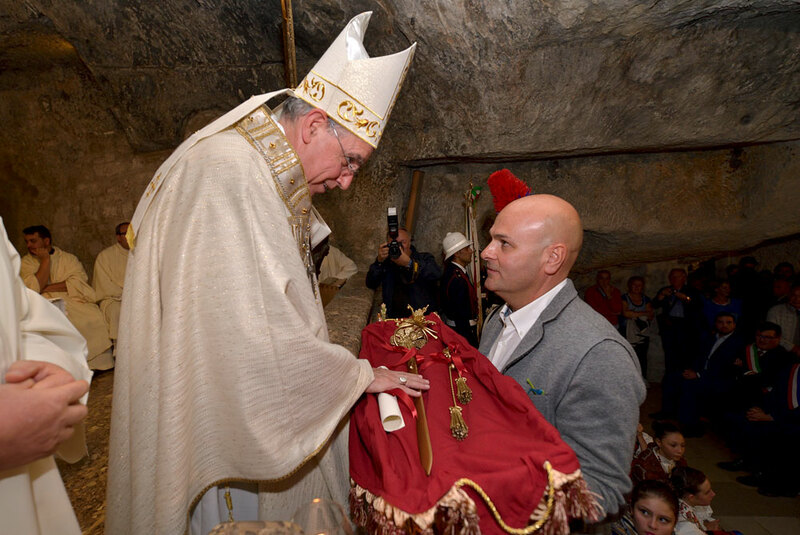 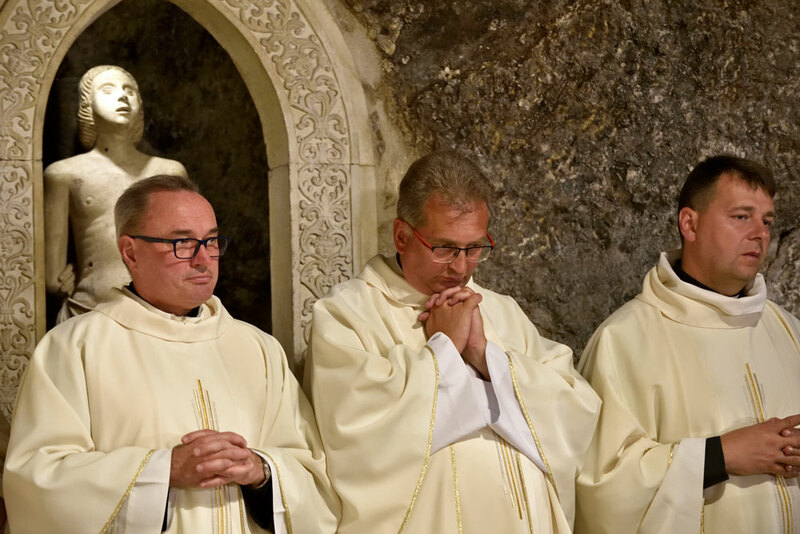 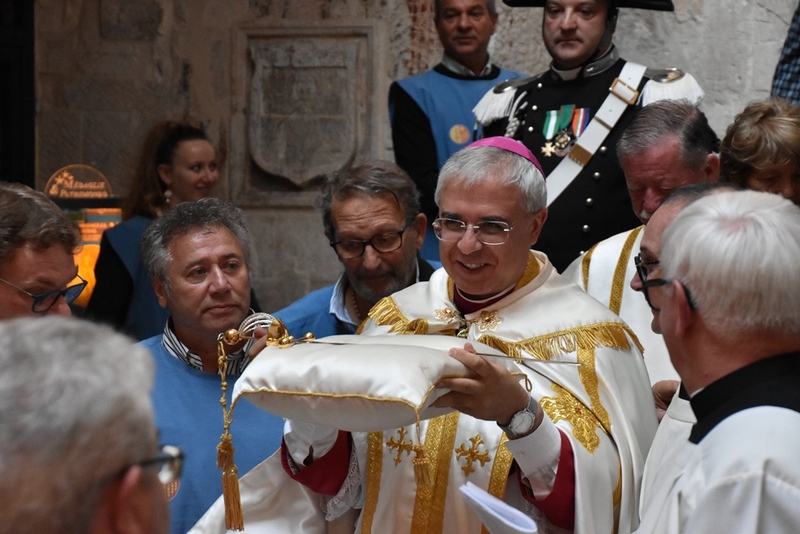 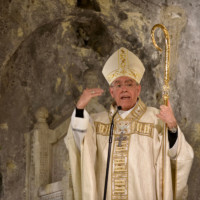 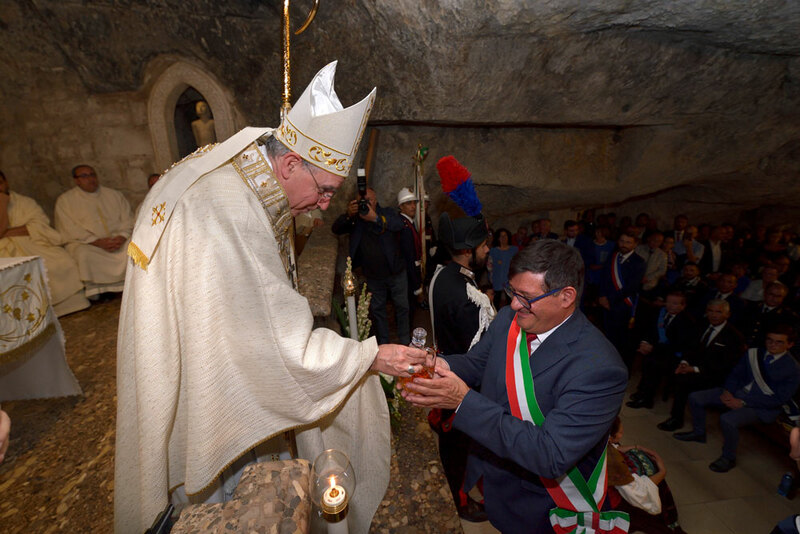 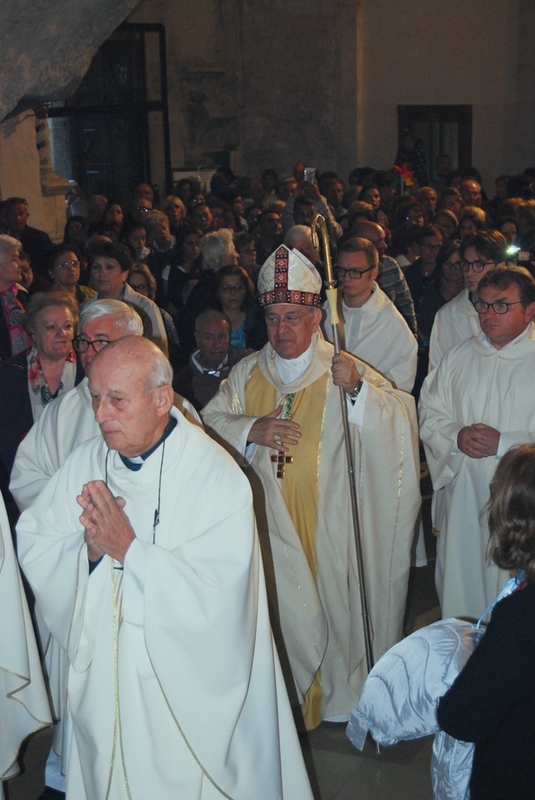 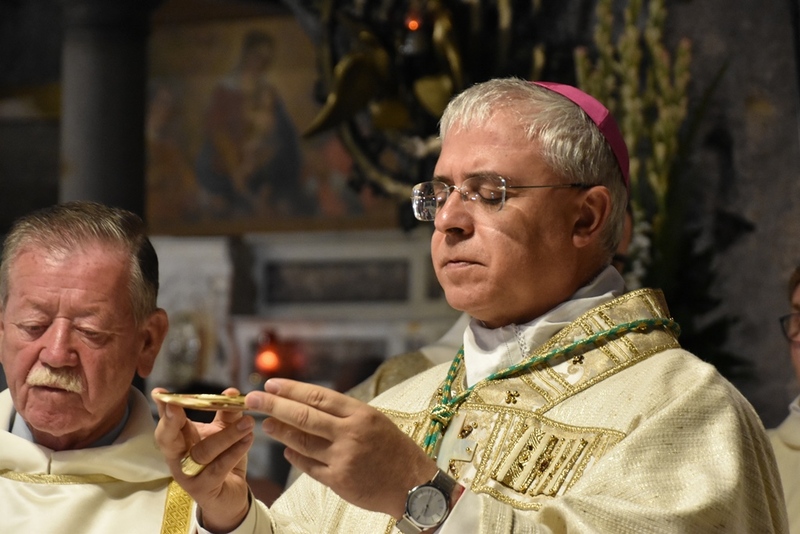 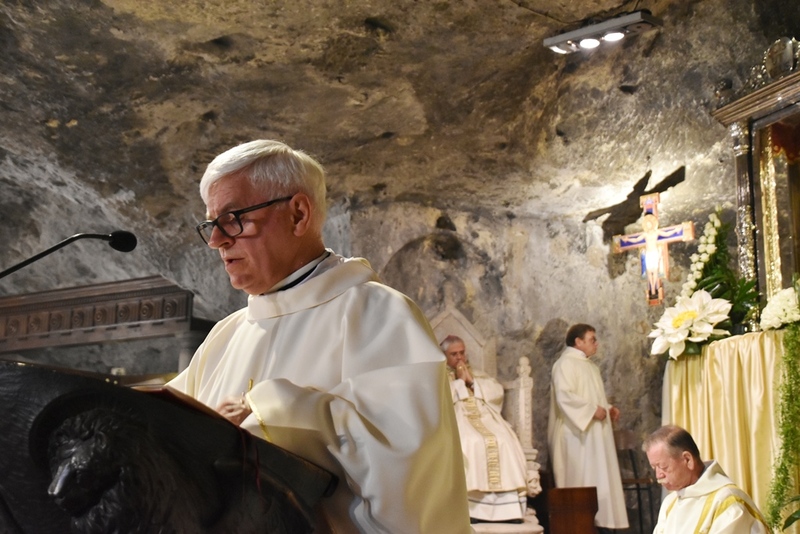 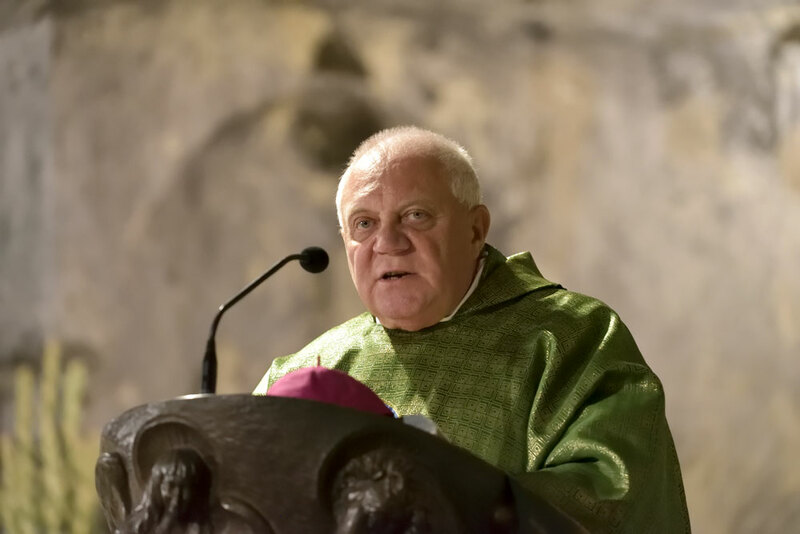 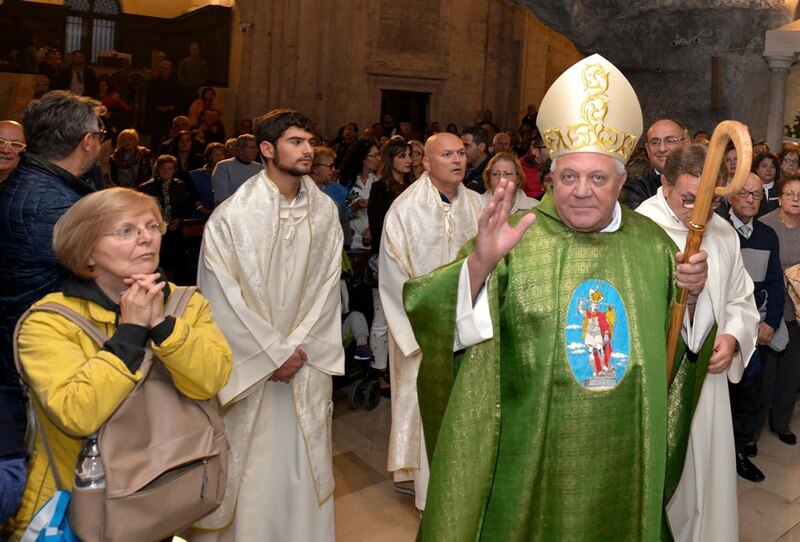 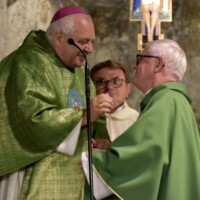 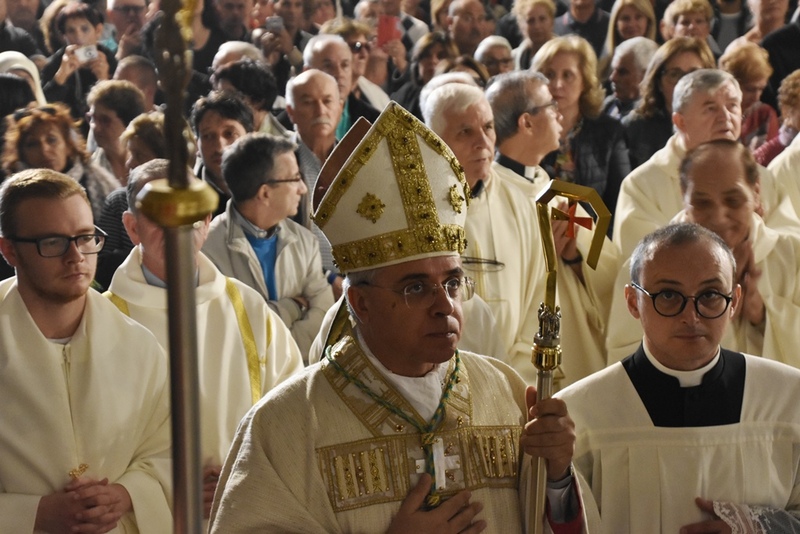 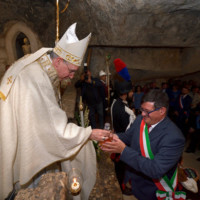 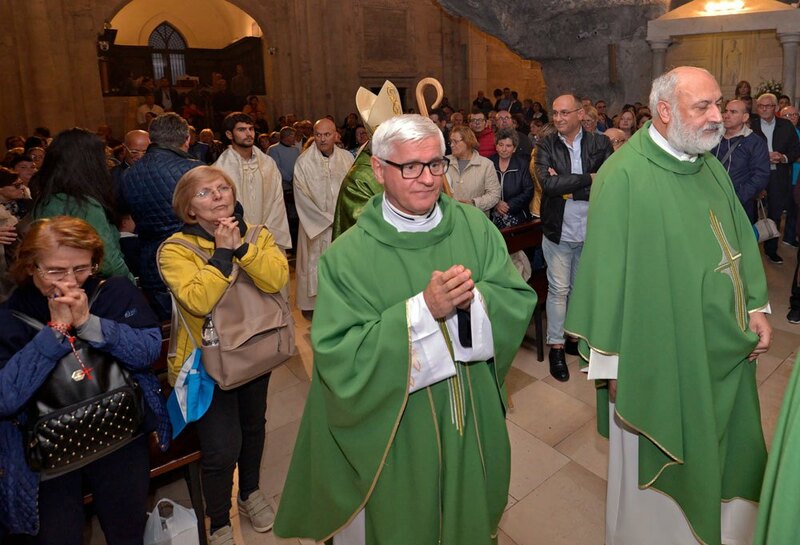 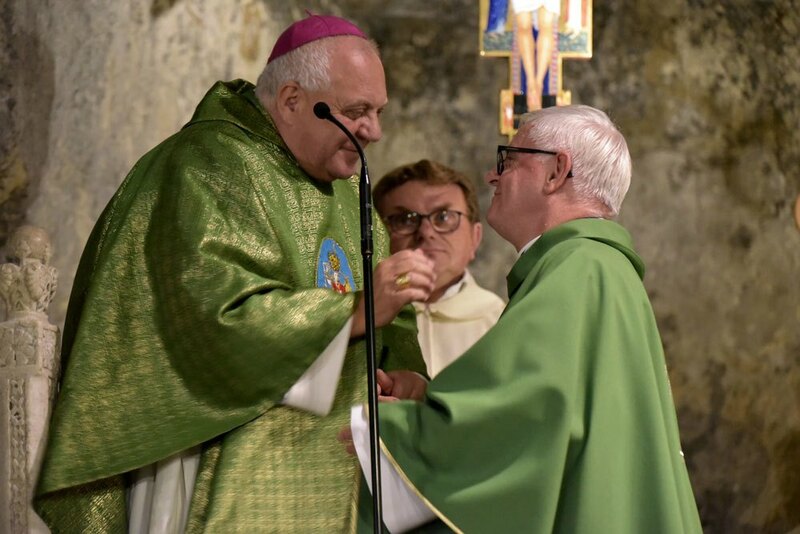 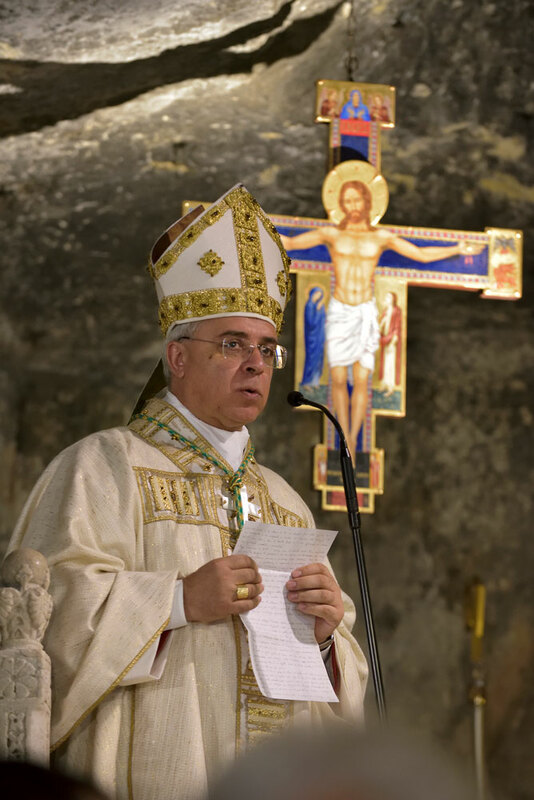 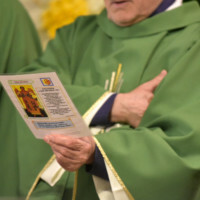 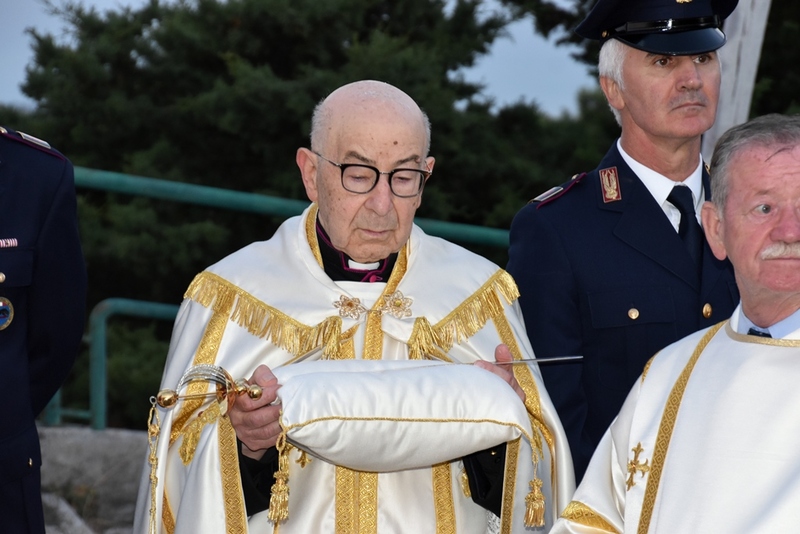 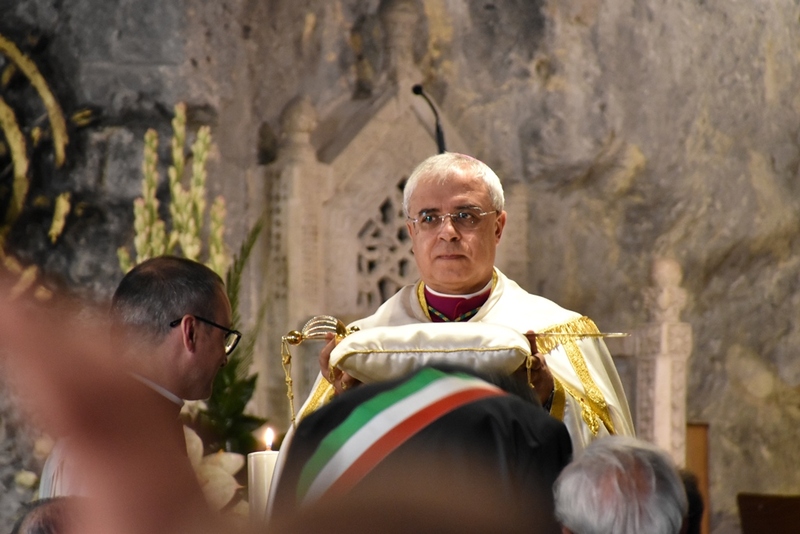 Francesco Pio Tamburrino, Archbishop emeritus of Foggia – Bovino; in the evening, Monsignor Giuseppe Giuliano, Bishop of Lucera – Troia, who thanked the Lord and the Celestial Prince together with all the staff, collaborators, volunteers and benefactors of the Shrine. 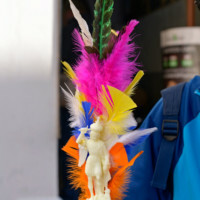 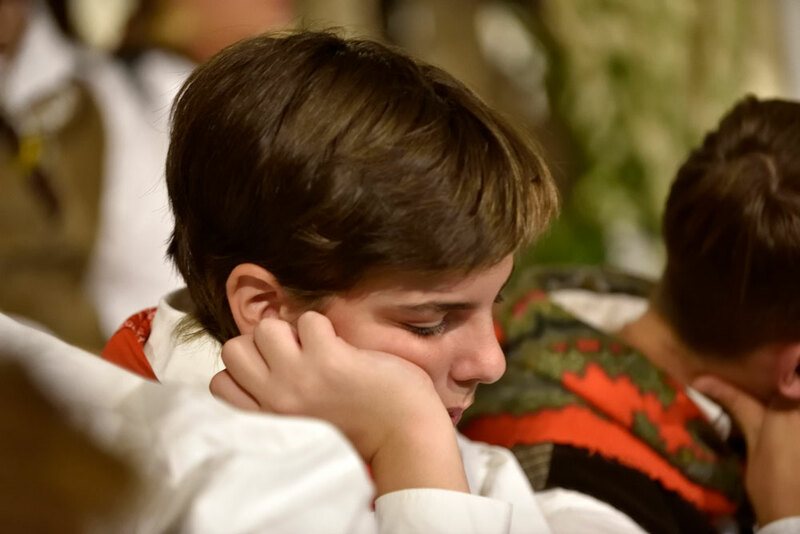 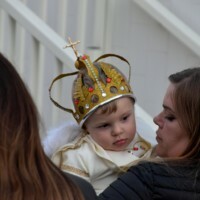 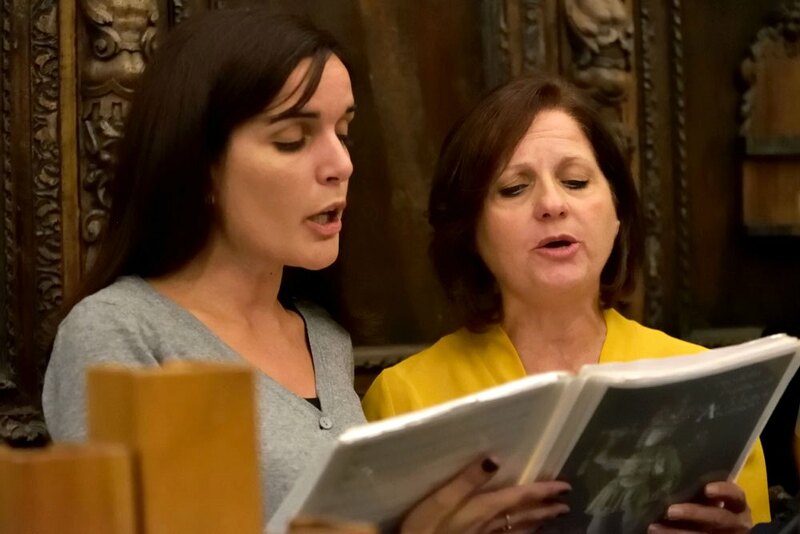 But more than words, they can “speak” the images: here is a collection of photos* that will tell the highlights of the Celebrations in honor of Saint Michael. 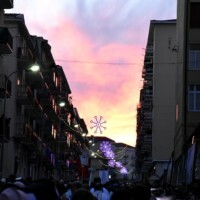 * Photographic Contributions: Leonardo Ciuffreda, Angelo Cotugno, Raffaele di Iasio. 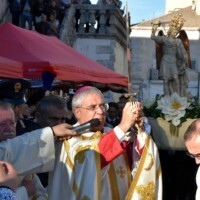 Your ticket for the: The Feast of St. Michael for images!